In the June 2018 primary election Measure C, the Watershed and Oak Woodland Protection Initiative, failed by 650 votes out of 37,500 votes cast. The contentiousness of the campaign was seen by many as not just a vote on the protection of watersheds but a referendum on the pace of development in the county as a whole. The supervisors, mindful of the community split that the vote represented, have renewed a Strategic Plan process to seek out a consensus on County priorities over the next three years. The Atlas Fire of 2017 has changed the landscape of Napa's eastern watershed. The knoll in the photo above was probably burned along with over 100,000 acres of woodland areas on both sides of the Napa Valley. What impact will that have on the silting of Napa's reservoirs this winter?. Will there be an impact from the millions of gallons of fire retardant sprayed on the fires? Will there be enormous pressure to plant vineyards as a way to restore the hillsides? Will the fire encourage or discourage more vineyard estate development? Will the concept of a watershed initiative to protect woodlands be even more important now that much of the woodlands have burned? Time will tell. Following the disqualification of the 2016 Woodland Initiative despite the effort made to collect over 6300 signatures, the initiative authors spent this last year revising the initiative in consultation with members of the Napa Valley Vintners. They have made a new proposal which, unfortunately is taking a bit of pushback from other stakeholders. A proposed initiative has been put forward for inclusion on the June 2016 ballot. Its purpose is to begin to preserve the forests of Napa county and the protection that forests provide watersheds, stop the depletion of the aquifers under the watersheds and the depletion of wildlife habitat all of which are in danger as a result of continued vineyard development in the hills surrounding the Napa Valley. It is the Water, Forest, & Oak Woodland Protection Initiative of 2016. More about it is here. 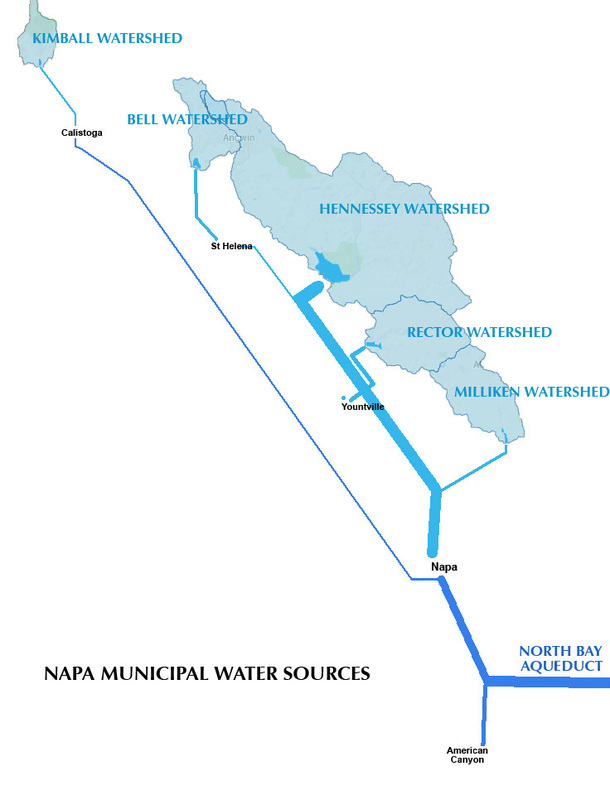 Most of the water used to supply the municipalities of Napa County comes from 5 county reservoirs and the watersheds that supply their water. As such it is a concern to all residents of the county, not just the agricultural users who pump the aquifer water that the watersheds replenish, how the watersheds are maintained and exploited. The conversion of natural landscape in the watersheds, particularly in the last 20 years, to agricultural use and the lessening of rainfall in an age of global warming, has begun to raise not only questions about the ability to replenish the water resource, but of the quality of the water resulting from agricultural runoff. For the past few years the county has approved 500,000 gal/yr of additional winery capacity per year. Assuming 75% of source grapes must come from Napa, that implies 500-750 new vineyard acres planted each year. Most, if not all, must be planted in hillside areas. Four major hillside projects have been in the works for years: Soscol Mountain Vineyards, Upper Range Vineyard Project , the Circle S Ranch project already approved near us on the Miliken watershed and adjacent to it the Walt Ranch Project (it's site is just visible on the left flank of the ridge in the photo from Atlas Peak) and which I will continue to follow on our Walt Ranch page. There are now also more vineyard conversions on our Rector Watershed. I have created a separate to document issues concerning the Rector Watershed. Only now with the acceptance in April 2014 by the Board of Supervisors of the Napa County Groundwater Monitoring Plan is the problem beginning to be studied. The work is the result of the Groundwater Resources Advisory Committee (GRAC) and documented on their final presentation on groundwater monitoring. Unfortunately, the eastern and western mountains of the County have not been included in the monitoring program. Given that most new vineyard development seems to be taking place in these areas that seems a shame. Perhaps it is felt that knowing the state of the aquifer under the valley floor says something about the aquifers in the hills. It is our hope that a monitoring program may also be instituted here to insure that the enormous amount of watershed conversion that is taking place does not produce the shortages that are beginning to happen in the western hills around Mt. Veeder road. Each new vineyard or winery project may or may not have impacts on the availability of neighbors water supply. These potential issues are presented by neighbors at each hearing for new projects and are generally dismissed (along with other issues that might change the quality of life in the neighborhood) by the County and developers as NIMBYism. No testing is done before these projects occur so no one knows what the water situation is. And the State refuses make public secret well logs filed by drillers at the time wells are dug which might be enlightening. [The 2014 Sustainable Groundwater Management Act in response to the state's water crisis now has made this information public]. The county uses a nice round .5 acre-ft per acre when calculating the availability of water on hillside sites - regardless of how many other adjacent wells have come into production. It is an arbitrary and unverified number. New wells, of course, are dug at greater and greater depths to insure that the neighbors run out before they do. If a neighbor's well runs dry the developer and the County tend to claim that the old wells just aren't deep enough and need to be replaced (at whose expense?). The County needs to take a more serious approach to these issues at the approval stage with monitoring of neighbors wells before and after a new well is dug. The depletion of the water that supplies a neighbor's well water is not just a NIMBY issue - it is a depletion of the water that supplies us all. [UPDATE: The County has responded to this concern and their Water Availability Analysis was modified in 2015 to require site-specific Tier 2 analysis in the watersheds]. 2015 Napa County Comprehensive Groundwater Monitoring Program Report. The Trail at Soda Canyon is drying up! Chris Malan has passed along the email below from the State Department of Water Resources which indicates that the Napa Subbasin has been reclassified in a draft document from a "medium-" to "high-" priority basin. It is unclear how this change would affect Napa's Groundwater Sustainability Alternative but does suggest that the condition of the Napa Subbasin may be of greater concern than the county has indicated. A public comment period on the Draft runs through July 18th, 2018. The DWR Sustainable Groundwater Management Program today released a draft prioritization of groundwater basins as required by the Sustainable Groundwater Management Act (SGMA). The 2018 SGMA Basin Prioritization is scheduled to be finalized by fall 2018 after a 60 day public comment period that starts today and runs through July 18, 2018. Basins throughout the state are ranked high-, medium-, low-, or very low-priority. Basins ranking high- or medium-priority are subject to SGMA. Of the 517 groundwater basins statewide, the newly released draft prioritization identifies 109 basins as high- and medium-priority, which includes 14 basins newly ranked as high- or medium-priority. Additionally, 38 basins previously ranked as high or medium-priority are now ranked as low- or very-low priority and are no longer subject to SGMA. Draft prioritization results can be viewed using DWR�s newly developed visual application tool, the 2018 Prioritization Dashboard. DWR will hold a public webinar May 30 to present the draft results, followed by statewide public meetings at the end of June. DWR will be taking public comments on the draft results, including additional data or information that is consistent with statewide datasets identified in the Basin Prioritization Process and Results Document. For more information, please refer to the 2018 SGMA Basin Prioritization Frequently Asked Questions. When the 2018 SGMA Basin Prioritization is made final, the basins newly subject to SGMA must form Groundwater Sustainability Agencies (GSAs) within two years and develop Groundwater Sustainability Plans (GSPs) within five years, or submit an Alternative Plan within two years. DWR provides a wide-variety of resources and services to support local agencies and GSAs in implementing SGMA. Low- or very low-priority basins are not subject to SGMA, but are encouraged to form GSAs and GSPs, update existing groundwater management plans, and coordinate with adjacent basins to develop a new groundwater management plan. Dan Mufson of NapaVision2050 has sent a copy of his 2/15/17 letter in response to the County's Sustainable Groundwater Management alternative critical of the alternative's lack of consideration of an increasingly dryer climate future. This is a summary of documents and posts on Napa County's sustainable groundwater management alternative plan, titled Napa Valley Groundwater Sustainability - A Basin Analysis Report for the Napa Valley Subbasin, in response to the State's Sustainable Groundwater Management Act (SGMA). 12/13/16 Staff Presentation of supporting documents for the Napa Valley Groundwater Sustainability - A Basin Analysis Report for the Napa Valley Subbasin to the California Dept of Water Resources (DWR), Item 9A on the Board Agenda. Dan Mufson: got Water? Will you have water? Chris Malan has sent this informative email concerning the WICC workshop that was held on Nov 3rd, with the resulting workshop report to be presented to he BOS on Dec 13th 2016 [now Dec 20th]. Public comment is open on the County's recent study of groundwater (gw) in the Napa Valley, in order to comply with the California State Law: Sustainable Groundwater Management Act, SGMA. A workshop is being held tomorrow, November 3rd, from 3-6 at 2121 Imola, Napa County Office of Education. Public comment (3 minutes) is allowed after their consultant presents the study. You can review the Draft Basin analysis (DBA)/Napa Valley Groundwater Sustainability documents here. There consultant is Luhdorff and Scallimini (LS) who say gw in the Napa Valley aquifer is stable and does not need gw management. False baseline of gw surface elevation: historically gw was at the surface (0 mean sea level) level in Calistoga-now gw is 10 feet below the surface in Calistoga and there is on-going dewatering of the Napa River from Calistoga to Hardman lane. misleading information about groundwater quality-LS admit that gw quality is poor in many areas of the County due to boron, arsenic, nitrogen and heavy metals but dismisses this by calling it �normal�. fails to discuss or define � undesirable results� required by SGMA such as: declining gw quality, wells going dry, fish kills, dewatering of the Napa River and streams, salt water intrusion, land subsidence; all of which are occurring now, on-going and re-occuring since January 2015. If �undesirable results� are present in the Napa River watershed, the County is required to do a Groundwater Sustainable Plan, GSP, by 2020 and a Groundwater Sustainable Agency, GSA, by June 2017. Because of this, Napa County shouldn�t have this Alternative monitoring plan but instead get going on a Groundwater Sustainable Plan, GSP. 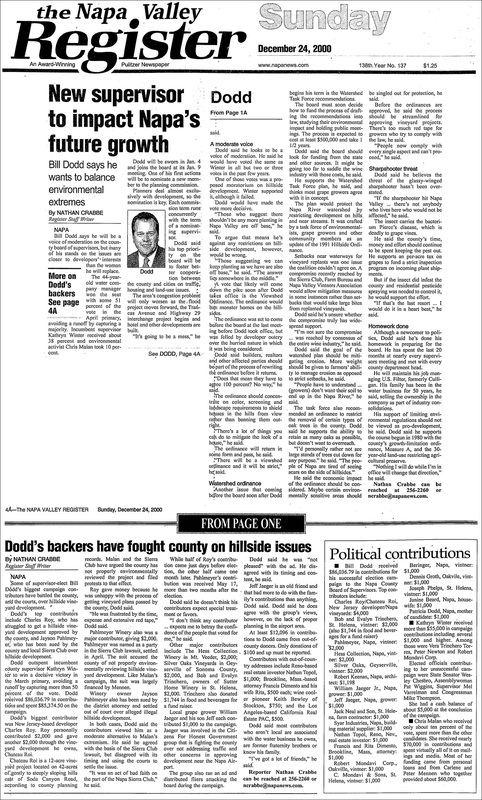 Background on why Napa County has chosen to do a DBA, (just continued monitoring) instead of Groundwater Sustainable Plan (includes a plan for sustainable extraction of gw): The Sustainable Groundwater Management Act (SGMA), historic legislation enacted by Governor Brown in September 2014, provided a new structure for sustainable management of California�s groundwater basins. On January 1, 2015 the California Department of Water Resources (DWR) began implementing the Act, including the development of new regulations to guide local groundwater sustainability efforts. SGMA established a sustainability goal for groundwater basins throughout the state, prioritized basins, established a timeline for implementation, and provided for new Groundwater Sustainability Agencies (GSA). It also required the development of Groundwater Sustainability Plans (GSPs), or Alternatives that are equivalent to them, to ensure that basins are operated within their sustainable yield. In basins that have ongoing successful groundwater management programs, a local agency may elect to submit a Basin Analysis Report Alternative that demonstrates that the groundwater basin is being sustainably managed. With direction from the Board of Supervisors on March 3, 2015, Napa County began work to implement SGMA through development of a Basin Analysis Report for the Napa Valley Groundwater Subbasin. Napa County was well suited to meet the requirements for this Alternative due to its groundwater sustainability program, which includes: an ongoing and evolving groundwater monitoring network and program, annual groundwater conditions reporting, an Updated Hydrogeologic Conceptualization and Characterization of Conditions Report (2013), development of new groundwater/surface water monitoring facilities along the Napa River, and a long-term public education and outreach program through the Watershed Information & Conservation Council of Napa County. You should come tomorrow and listen to the presentation and be prepared to say something about the process and lack of correct information being presented to the both the WICC Board tomorrow and subsequently the BOS on Tuesday December 13, 2016 at a Special Meeting. Keep in mind that if the BOS approve this Alternative to be submitted to the Department of Water Resources by January 1, 2017, and the DWR accepts this bogus Alternative this denies us groundwater management for an undetermined amount of time. Our aquifers deserve our voice if we want sustainable gw for future generations. The time to act is now. The WICC Nov 3rd workshop agenda with supporting documents are here. DIssenting voices to the County's proposed alternative to SMGA requirements by Gary Margadant and Gordon Evans among others are summarized in this response to comments, one of the documents in the Nov. 3rd workshop packet. I need to fully understand why the County has painted itself into a corner by going "all-in" for the alternate plan. Initially, what individual or group came to that determination? Was it Patrick Lowe's regime, WIIC recommendation, BOS? I would hope it wasn't from the consultant group L&S. Our year long study related to enhanced protections for our watershed [the subverted Oak Woodland Initiative] uncovered strong needs for preservation of our oak woodlands and riparian corridors. This is about the future of not just supply, but equally important the quality of that supply. How can we plan for our children's future without ensuring quantity and quality? I know you would agree that our water resource is THE most important resource needed to sustain life. Why are we gambling with this absolutely-necessary resource for life itself? What was the reasoning for selecting the alternate plan? It would be heartbreaking to think it was about $$. We need and will continue to demand an ongoing process like a sustainable groundwater plan. I simply am dumbfounded that we're trying to cut corners here! Dumbfounded! Lastly, L&S appear to have cherry picked data and modeling to support the alternate plan, which is disturbing enough. But more scary is that their future assumptions are based on current conditions: like no increased development. What a "crock." We have the demand for 5,000 more acres of conversion from forest to vineyard in the pipeline right now. Many of those 113 wells are recently on line. We are gambling with our most important resource. This is outrageous and very troubling. I've admired your intellect and participation for several years now. Why do you not see the contradiction here? Those of us who are only in this fight because of the need for truth, justice and the dignity of life will continue to educate our fellow citizens that we are being sold ' a bill of goods" leading to the ultimate destruction of our Valley. We will continue until our last breaths to awaken our residents to these corporate blind ambitions. It's in there. Will it kill you? Charlotte Williams forwards this effort by Living Rivers Council (Chris Malan) to present the community impacts of Glyphosate use in Napa to the EPA. "A lab test of 10 California wines concluded they all contain the active ingredient from weed-killer, glyphosate, a chemical classified a 'probable carcinogen' by the World Health Organization. 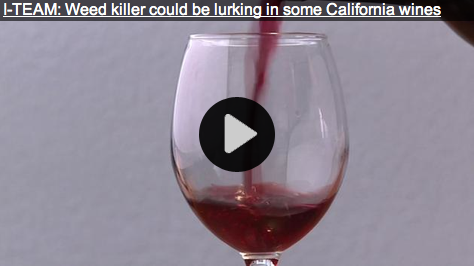 This I-Team investigation is sending shock waves through wine country." Sometimes a map helps with these things: As you can see on the map, Circle R Ranch and Walt Ranch together form a massive potential barrier to wildlife, (and hikers) along the spine of the Vaca mountains that form the eastern edge of the Napa Valley. This granting of a conservation easement for such movement is a huge act of civic responsibility and environmental consciousness. 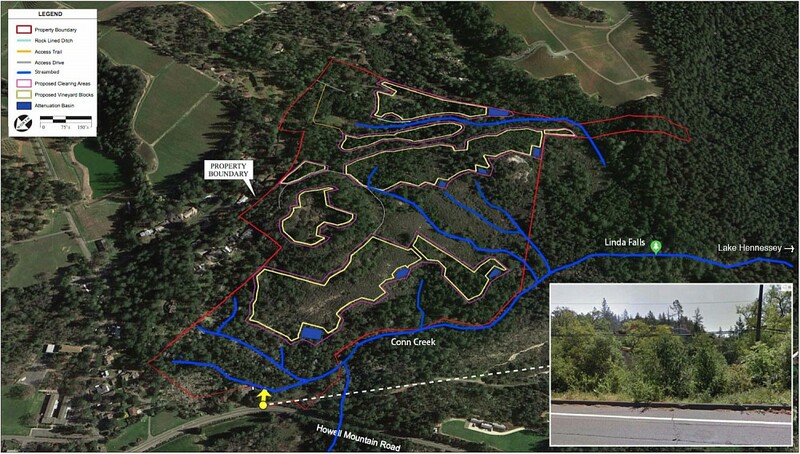 One can only hope that the Halls on the Walt property might become similarly concerned about a legacy of environmental stewardship of Napa's wild lands, in contrast to their urban development potential, and recombine the 35 developable parcels into a single property with appropriate conservation easements. Their proposed vineyards would still be a source of produce for their wines (or of profit for resale) as was their stated intention in the EIR. 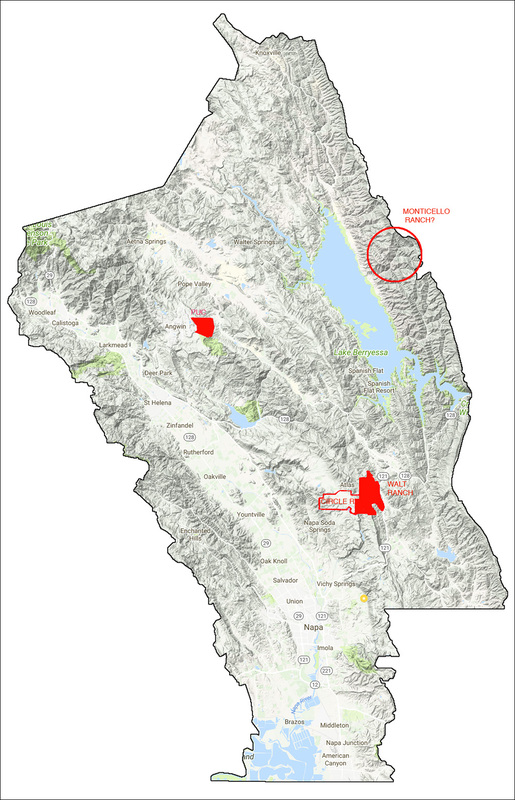 Land Trust CEO Doug Parker is quoted as saying �We�re interested in building a corridor of contiguous, protected land across the ridge on the east side of Napa Valley.� On the map above it would appear that the stretch from RLS State Park to Lake Hennessy is looking quite promising. From Lake Hennessy to Skyline Park it seems like a much more difficult proposition. A trail down the ridge just below the huge Atlas Peak Sutro Ranch Preserve is blocked by two private estate developments, Circle R and Walt Ranch. The Circle R development has discussed the possibility of a 500+ acre conservation easement. Would that include a public trail? The Walt Ranch developers have yet to weigh in on a conservation easement. 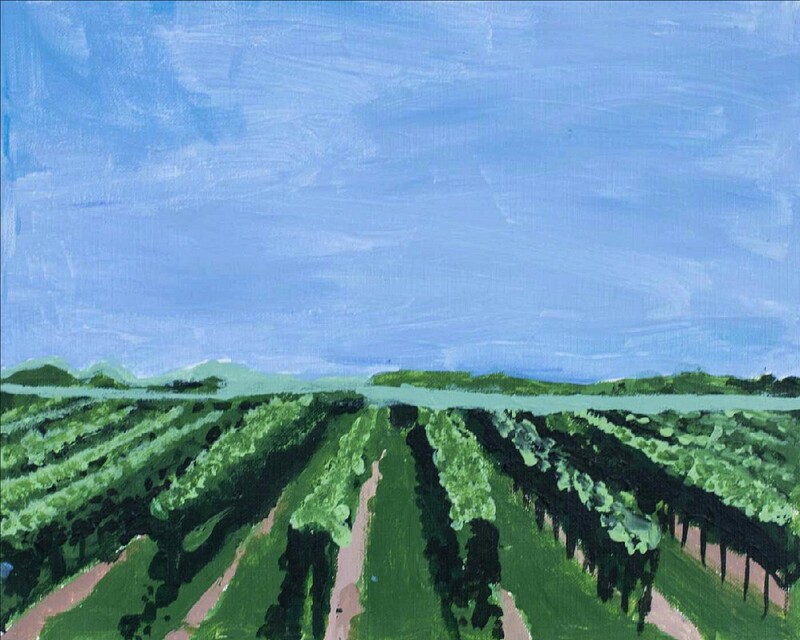 My husband and I have had vineyards in Napa County for over 35 years. Our Dry Creek Road ranch was one that did not burn, thanks to the many first responders and to the temperamental wind. We are certified biodynamic organic farmers and believe agriculture and the native local ecology can co-exist in healthy balance, but only with active respect for the needs of the larger ecological system. To this end, I want to address fire in our zoning-designated Ag Watershed Open Space lands. Even though our own ranch did not burn, we know it�s only a matter of time until it does. Fire is an important part of the ecology of Napa County. Our warming planet means we will have even more fire�and we need to plan for it. We need fire, but it needs to move through quickly and with less intensity. While vineyards acted as firebreaks in a number of circumstances in this last fire, how many of those vineyards were irrigated? In a time of change of climate, water will become increasingly scarce, as it has been these last years. Do we have enough water in our Ag Watershed Open Space lands, which have a different geology from the valley floor and much less ground water, to realistically consider using irrigated vineyards as firebreaks? Farming with the environment means growing what can co-exist with the facts on the ground of water, soils, and temperature. At least 80 percent of our vines in Napa were dry farmed before the French blind tasting in the 1970s. Pushing vines for production by irrigation is something we need to reconsider into the future. Do dry farmed grapes perform as well as irrigated vines for firebreaks? Our Ag Watershed Open Space lands are key to the water supply of our cities. Oak woodlands and forests restore ground water; irrigated vineyards use it. The reason we had such a catastrophe was not because we have oak woodlands and forests but because we have not managed our so-called wild lands for two centuries, ever since the white man arrived, allowing underbrush and understory to build up. The health of Napa County environment is dependent on how we manage the forests and oak woodlands. Oak woodlands and forests do not contaminate our surface and ground water with agricultural fertilizers, pesticides, fungicides, and herbicides. As important organs of the watersheds, they protect the water supply from silt and erosion. Pure, abundant water for our population is dependent on the health of our watersheds. The fires necessitate that we rethink our approach to the watersheds. There is so much scientific research that says do not cut these burned areas, let them recover � that the best action is no action. This is a time for our governing officials to bow their heads to scientific research, not succumb to political pressure for business as usual. The health of our beautiful valley begins at the top of the mountains in the Ag Watershed Open Space lands. Our water supply is dependent on this health. Oak woodlands and forests are important components to aquifer recharge, to the health of the Napa River and our reservoirs, and to clean and abundant water for all of us. Water and Fire remind us of our connection to each other. What we each do on our own land affects us all. Advocate that our county officials pause, allow our burned lands to regenerate, and take steps to manage the understory of our oak woodlands and forests that have not burned. Our population is dependent on it. Vineyards don�t save lives; water does. As the watersheds that supply municipal reservoirs continue to be clear-cut and ripped for vineyards that are then bathed in chemicals, the potential issues of city water safety have come to the fore. Napa City, which provides over half of the county's residents with water from the Hennessey and Milliken reservoirs, has decided it's time to verify whether or not the conversion of natural landscape into vineyards poses a threat. While the Milliken and Hennessey watersheds are the focus of this effort, and may turn up contaminants, more active study should really be done on the county's natural laboratory for watershed pollution, the Rector watershed. It is by far the most converted watershed in the county and, like a coal miner's canary, the most likely to show the negative impacts of sedimentation and chemical pollution now that will only become apparent in the Napa city reservoirs many years hence as development continues. There may be a dis-incentive to study its water: serving the veterans home (which sells water to the town of Yountivlle), Rector water falls under the purview of the state. As such it is probably out of the hands of local governments to monitor. We understand that the Veteran's home is undertaking a periodic study of Rector's water quality and any new information will be added here when available. Where have all the vineyards gone? The numbers of the latest Napa County Crop Report are out. The county's Crop Report archive is here. The crop reports make for interesting reading even if you're not into crop reports because of the agrarian drawings and paintings of budding young artists that illustrate them. The latest contest winners are here. There are other graphs and photos and news and historical articles as well which liven up the raw numbers. The ever increasing value of the Napa grape crop is always of great interest to everyone: it is a nominal sign of the health of the industry and the potential for the survival of an economy based on agriculture rather than, say, tourism. The value of this increase was put into a chart in the 2013 Report, page 6 here. Economists and stock market analysts might have some concern when seeing price gains such as these, but obviously the industry takes pride in the numbers. The increased value of the crop probably comes from different sources. The often stated reason is that the wines made from them are so good that the price is justified. In fact, it is probably simple supply and demand: as the total crop is divided among more and more vanity labels (175 new wineries have been created since 2006), each willing to pay any price to build their high-end brands, the price has exploded. From an urban development standpoint it is not the rise of the crop value, but the stability of the supply that has interested me. In 2016 43,000 producing acres of grapes were harvested in Napa County. In 2006, the number was 42,188 acres. In 2008 it was at 42,870 and has gone up and down by less than 2% since, a normal seasonal variation. Yet my intuition over these 10 years, as I have driven up from Berkeley each weekend, is that a fair number of vineyards have come online in that period. Is it true that vineyard creation stopped in 2006? In the article (and later directly verified), Planning Director Morrison indicated that 4,347 gross acres of vineyard development has been approved since 2006, a period in which approvals have been slowing. That would translate to perhaps 3477 net acres of actual vines. While not all of those would be producing acres in 2016, it can be assumed that there is an equal quantity (or more) of vineyard acres approved before 2006 that began producing in the 2006-2016 period. So at least 3400+ acres of new vines have probably been added to the "producing" acerage since 2006, but only a 1000 acre increase has shown up in crop reports. Why are approvals for new vineyard developments not translating into a similar increase in the Napa crop acerage being harvested? Where are the missing 2400+ acres? From the perspective of someone concerned about the urban development of the county, I would like to know what that missing acerage is currently being used for. Deforestation leader: Cal Fire or County? Napa County generates the most Timber Harvest Plans in the State! At the BOS on Mar 7th 2017 (item 9A here) the Board considered a request by the California Department of Forestry (Cal Fire) that the County should become the lead agency on deforestation projects within the county that involved Timber Harvest Plans (THP's). The staff letter on the issue is here. Normally in projects that involve THP's (i.e where there is harvesting of timber species in preparation for agricultural or development clearing) Cal Fire acts as the lead agency for CEQA review and the county chimes in on conservation regulations where appropriate. But as the Cal Fire administrator indicated at the hearing, Napa County ECP and CEQA review has become so much more thorough that they feel it is better for the County to be the lead agency with Cal Fire providing their own input to the county. Their concerns were first aired in this letter concerning 4 projects they currently reviewing. Two of the projects are well along in their Cal Fire review and two of the projects are only at the Notice of Preparation (NOP) stage. Apparently after a meeting between Cal Fire and the County it was decided that Cal Fire would retain lead agency status on all 4 projects as indicated in this letter two months later. As of this date, however, 2 of the projects have been turned over to Napa County for CEQA review. Given the punishing process on Walt Ranch, given the fact that Cal Fire doesn't seem to charge for CEQA reviews?!! and given the much more opaque process that Cal Fire uses, I can understand why developers would be anxious to avoid having the county as the lead agency, and assigning lead agency to Cal Fire might be seen as a way to lessen the scrutiny that deforestation projects might otherwise receive, essentially an end run around the more robust concerns that the county and its citizens have concerning these projects. Sup Wagenknecht asked the Cal Fire administrator if the proposed arrangement was unusual. This would be the first such arrangement, she indicated. 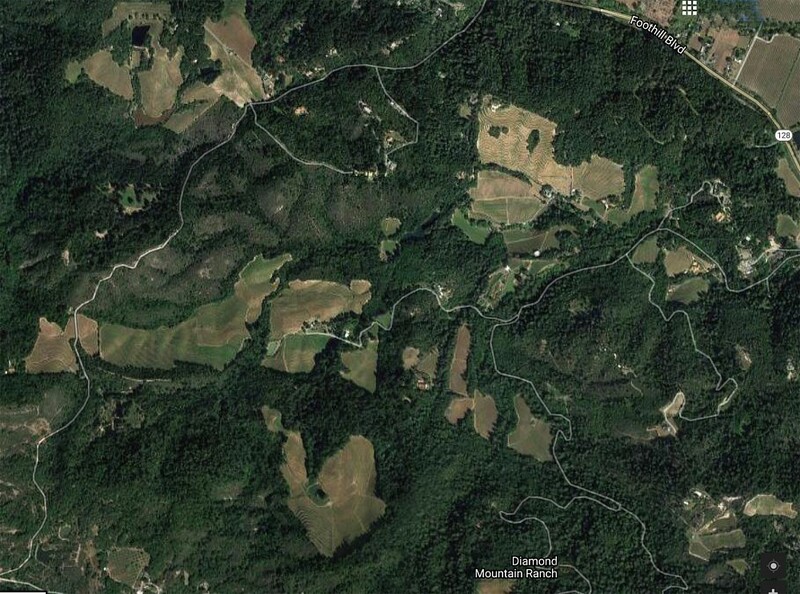 In addition to the greater thoroughness of the County ECP process, she said, Napa has the most timber conversions anywhere in the State, a remarkable statement but understandable when looking at the many patches of converted timberland on Google Map images of the watersheds (see photo). The Supervisors passed a motion to make the County lead agency on future development conversion projects that involve THP's, and to request, at Sup Dillon's insistence, that Cal Fire make the county lead agency on the 2 "NOP" projects currently under review. There have been two recent items of note regarding the ECPA review process. On January 20, 2017, staff sent a notice to stakeholders and interested parties indicating that PBES would no longer accept hydrologic analyses and vineyard ECPAs designed in reliance on modified hydrologic soil group (HSG) assumptions. The HSG methodology is no longer recommended by either the Resource Conservation District or the Regional Water Quality Control Board, and is not supported by Department engineering staff. We are working with those applicants who have not yet transitioned to the preferred approach. Recently, CalFire held a training exercise on private property in the Soda Canyon area. It generated complaints from nearby residents who were concerned that illegal brush clearing and/or grading was occurring. Section 18.108.050. (H) of the County Code exempts the creation and/or maintenance of firebreaks required by, and completed under the direction of the California Department of Forestry. However, the exemption does not specifically address fire training exercises. Similarly, work to create fuel breaks (not fire breaks) is being proposed by Napa Firewise. Staff is working closely with both Firewise and CalFire to ensure that necessary fire prevention work is allowed to move forward, in a way that does not impact the environment or create violations of County Code. At the Napa County BOS [see list of acronyms at end] yesterday they voted to approve two changes in regards to the approval of erosion control plans for the conversion of lands to vines. The RCD along with the vineyard consultants developing the ECPAs can no long 'play games' with modeling the hydrologic soil groups (HSG) post deep ripping and deforestation. They have been claiming that deep ripping (after deforestation) improves soil infiltration of water thereby improving groundwater recharge, decreasing runoff and erosion post project. the San Francisco Regional Water Quality Control Board (SFRWQCB) met with LRC and our consultant on 12.2016 to understand the failings of the ECPA modeling so as to properly implement the WDR for vineyards in Sonoma and Napa Counties to comply with the 303(d) listing of the Napa and Sonoma River for sediment pollution (first ever DWR for vineyards in the State). LRC has been communicating with the SFRWQCB since 2000 along with filing a CEQA lawsuit on the Sediment TMDL and inadequacies of the ECPs not meeting water quality parameters to support salmonids. The CEQA process for the draft WDR finally gave a window of opportunity to collaborate with the SFRWQCB developing a WDR that adequately deals with the failings of the ECPAs and properly implementing the Sediment TMDL. The SFRWQCB staff asked for a meeting with LRC and our hydrologist for information about how to deal with the ECPA failings in the WDR. We met and discussed the 'games' being played by the RCD and applicants consultants on manipulation of HSGs post ripping and deforestation producing false information about runoff, infiltration and erosion. LRC declared these scientific truths with the SFRWQCB that: 1.) water infiltration may increase slightly after ripping but then the soil compacts and the pores close and water sheets off. 2.) because of #1 there is increased rate of runoff in some soil types that has not been mitigated for in the past (WALT Ranch vineyard project in litigation now) because the RCD and consultants had a theory that the water infiltration increased post ripping through the newly ripped loose soil. This is now completely debunked by the LRC consultant along with the NRCD who confirmed our consultant is correct. The SFRWQCB agreed too! So successful is LRC on this through past litigation and open communication with SFRWQCB during the WDR comment period that a workshop is being held on March 18th and outreach is happening with the vineyard consultants that they can NO longer make these false claims to get a pass on CEQA that the project impacts on hydrology and sediment discharge are less than significant! Because the SFRWQCB agrees with LRC the WDR requirements for hydrology and sediment must be properly modeled! Finally yesterday the County of Napa's PBES department engineer testified to the BOS that vineyard projects that do deep ripping (often preceded by deforestation) can no longer apply their false theory and manipulate HSG modeling to get a pass on rate of runoff, erosion and recharge. Living Rivers Council has worked on this for over 17 years and finally there are changes coming through the SFRWQCB telling the Counties that their erosion control plans must have robust engineering/modelling that shows scientific evidence of deep ripping and deforestation impacts on soil types. This is a much higher CEQA bar now for these projects. The SFRWQCB is collaborating this with the NCRWQCB for the implementation of their WDR in Sonoma County and beyond! FYI-with this the WDR will be rolled out soon and the BMPs for vineyards will be such that the ECPA must demonstrate no increased rate of runoff-this will limit the amount of deforestation in certain soil types. Cal Fire told the BOS that Napa County has the most TCP�s in the STATE! We need to really use this in our Initiative language, PR and fundraising. This means that Napa really needs initiative protection. On Dec. 19, 2016, the Register carried on article, "County Touts Water Plans," summarizing the Board of Supervisors' approval of the GSP-Alt plan which (in order to meet the requirements of the California Groundwater Management Act of 2014) is to be submitted to the State Department of Water Resources in lieu of forming a groundwater sustainability agency. This act, which was designed to prevent unbridled over-draughting of ground water and to afford greater transparency and opportunity for public input, also allowed the procedure chosen by Napa, when various requirements were met. It provided a time period for the public's input, which ended Feb. 14. Over the past several years, Napa Valley has experienced an ever-increasing growth in the number of vineyards and wineries accompanied by a proliferation in the numbers of wells and demands on ground water as more and more projects have shifted away from dry farming. Also, as proper farm land on the valley floor has been exhausted, more and more parties have sought and received approval by the planning commission and board of supervisors to farm the woodland hillsides which has resulted in the removal of untold numbers (undoubtedly in the hundreds of thousands) of centuries-old oaks from the watershed which in turn affects groundwater. The presentation on which the Supervisors acted in December stressed that "a central feature of the Act (SGMA) is the recognition that groundwater management in California is best accomplished locally." 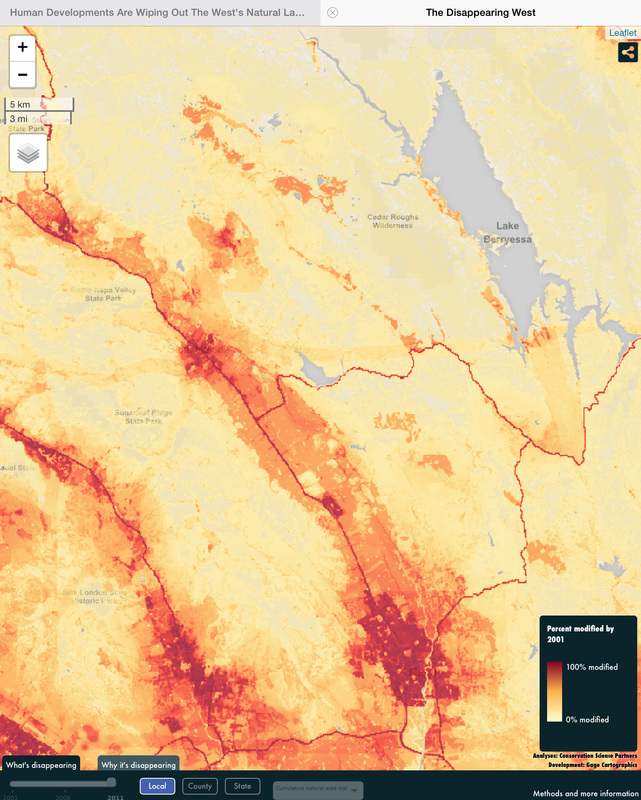 I think the validity of this assumption is contradicted by the disastrous results in many of California counties, e.g., land sinking up to two inches a month in the Central Valley caused by massive over-draught of its aquifers and a poignant article in the August 2016 issue of the National Geographic, which chronicled the disastrous results for many communities across the entire central portion of our county, caused by the over-draught of the Ogallala/High Plains aquifer. Undue self-interest, greed and political pressure too often override good judgment and scientific analysis when decisions for all citizens are considered. If one accepts that one of the intents of SGMA was to include the concerns, input and suggested solutions of affected citizens, I think that, despite the hard work and helpfulness of some civil servants, this intent was not met in Napa. Most of the data and conclusions required extensive review of relevant materials for the public to be able to understand and interact in a cogent fashion, which was not possible due to its very restricted availability. Public meetings were announced with short notice; documents to be discussed and analyzed were in short supply, if available at all, and there was never time (3 minutes usually) for the affected citizenry to engage in meaningful dialog. It was not difficult to leave the meetings/hearings with the feeling that decisions had been made much earlier and the outcome had been a forgone decision. A major concern involves an issue raised at a meeting of WICC, when one of the commissioners questioned the validity/reliability of the data presented by the consultants and used to support the Alt-Plan, viz., conclusions based on data collected from a very small sample of wells clustered near the Napa River raising the question of "cherry picking" the data. Another requirement for an Alt-Plan to be acceptable requires evidence of 10 years of sustainable yield of groundwater. It appears this conclusion is not met because it was drawn by intermingling data from different wells across time, which, again, amounts to a major sampling error. Another issue raised at the WICC meeting continued the use of drain-tile systems and its impact on ground water supplies. The handout indicated they had no data on the subject. However, casual observation suggests that huge amounts of ground water are being pumped into drainage ditches that flow to the Napa River, unlike earlier times when farmers pumped that water into mini-reservoirs/ponds for use during the summer. The consultants' reports, other documents and presentations at the Board of Supervisors meeting made it clear that GSP-Alt does not apply to all the people living/farming, etc., in the entire county. It excludes our watershed and known locations with poor ground water. In my opinion, this creates a rather bizarre and untenable situation of how our elected officials can provide for necessary and expected governmental services to a large number of residents by excluding them from the plan while, at the same time, despite water rationing, cities and the county continue to "sell" water to certain businesses. Wineries and vineyards continue to be approved despite protests by neighbors -- often numbering in the hundreds -- noting their negative impact on ground water and water-related issues affecting the long-term residents making the rational for such decisions unclear and difficult to understand. Orville Dam failure reminds us of our own aging Milliken Dam and it�s lack of full structural integrity since 1924. 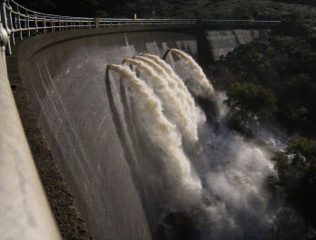 Several years ago, the State Division of Dams and Safety (SDDS) ordered the owner of Milliken Dam, the City of Napa, to lower the water surface level in the reservoir such that the pressure against the dam would be reduced due to unacceptable long term �cracking' in the dam�s concrete structure. It took many years for the engineers to come up with a design remedy short of lowering or removing the dam itself. The State engineers accepted the City of Napa�s remedy to bore 5 holes in the face of dam in hopes of keeping the water surface level 16 feet below the rim of the dam. How long has the dam been spilling this year? If so, for how long? Do you expect the dam to spill if it hasn�t yet? If so, when? Are there any new structural failures of the dam? If so, what are they? When was the last time the Division of Dams and Safety inspected Milliken Dam? When was the last time new recommendations were made? If so, what were they? Who is the official at the SDDS that inspects Milliken Dam? When did SDDS last inspect the dam? Are the SDDS�s monitoring reports available to the public? If so, please provide a link. These questions should be answered in a publicly noticed town hall meeting or put on the Napa City Council�s regular agenda. Not only is public safety of utmost concern, but there is unique and valuable aquatic habitat below the dam. Both interests must be protected ahead of any dam failure possibility. Given climate change (deluge to drought), increased erosion and runoff from watershed degradation (vineyards in the hills above Milliken Dam), and the age of this defective Dam, I would like to request that this issue be put on the City Council�s agenda for full public disclosure about the status of Milliken Dam. At the women�s rights and anti-Trump rally on Jan. 21, we were all energized by the size, unity and spirit of the assembled citizens. When our congressman, Mike Thompson, spoke of conviction, courage and determination that this is the time to �stand up,� we all roared with strong approval and understanding. We were there to stand up for the rights of women to control their own bodies, the right to adequate health care for all Americans, the right to marry whomever one may choose and the right for all people, of all colors, ethnic backgrounds, religious beliefs and socio-economic status to determine their own future; in other words, the right to self-determination without influence from the corrupt and small greedy segment of the one-percenters. These rights are bestowed to all our citizens from the basic structure of our bill of rights and our democratic system of government. They should include every race, gender and class. I feel compelled to point out that the balance of power is off-kilter not only in Washington, but right here at home in the Napa Valley. I was shocked to read that a wine industry lobby spokesman felt compelled to call Forge Pizza with a �courtesy call,� to tell the owners they shouldn�t be getting in the middle of a dispute between Napa Vision 2050 and the Napa wine industry. Yes, Vision 2050 is providing the needed resistance to expansion of vineyards into our hillsides, where the future of our water will be determined by whether we can enact and enforce sufficient protections for our watersheds. The environmental groups that comprise Napa Vision 2050 are totally supportive of the wine and tourism industry, but not at the expense of the citizen�s rights to a healthy, sustainable and quality future. Vision 2050 understands that with climate change, we don�t have the time to allow any more mistakes. 2016 was the hottest year on record, for the third year in a row. If we want to ensure that there�s adequate water supply in the future, we must protect our County�s watersheds at all cost, even if that means capping the allowable deforestation on our hills for more wine grape production. Portions of the wine industry lobby are, unfortunately, led by that small greedy segment of the very wealthy; by the same kind of bullies that many of us feel are stealing our rights at the national level. The wine industry creates thousands of jobs and donates millions to needy causes. But now some in the industry are turning a blind eye to residents� rights and are seemingly interested in turning Mother Earth into a toxic, unlivable planet in the name of quarterly profits. Most disturbing is that the other two measures that the county actually helped get to the voters, contain these same �legal technicalities.� Why was the watershed initiative jerked from the ballot? It�s hard not to draw the conclusion that the long arm of the bully segment within the wine industry reaches deeply into our county political machine, perhaps because some within the industry saw this initiative as a real threat to their continued vineyard expansion into our hillsides, at the expense of our watersheds. The issue will be decided in the Court of Appeal this summer. One need look no further than the friends who have filed in support of the watershed initiative to understand what�s at stake: California Native Plant Society, California Wildlife Foundation, Corporate Ethics International, Environmental Defense Center, Forest Forever, Forest Unlimited, Greenbelt Alliance, Save the Bay, Planning and Conservation League, Friends of Harbors, Beaches and Parks, Environmental Protection Information Center and Sierra Nevada Alliance. This watershed initiative example and the fundraiser show that democracy is in trouble in Napa County. If a small group dedicated to a sustainable future can�t even hold a fundraiser without being attacked by big business, we need to �stand up.� Local businesses should not be forced to pick a side when it comes to supporting a sustainable future for Napa County. Why would holding a fundraiser for a small community group alienate the wine industry lobby? This is a clear illustration of the over-sized influence this industry has in our community. Local residents have a right to organize and share information about a sustainable vision for our community. What�s at stake on the national level is exactly what�s at stake here at home. So let�s all �stand up,� right here, right now, to ensure our democracy shines with a brilliance never seen before. We were struck by some comparisons to the situation in Napa: The two economies are principally a combination of agriculture and tourism. Napa is about a third the size of Bali. (Napa and Sonoma together are about the same size). While Bali has always been renowned for it's rice production, a committment to tourism in the last few decades has made it 70-80% of the island's economy. Tourism is about 30% of the Napa economy (and growing). There are some 8-10 million foreign and domestic tourists coming to Bali each year, somewhere around 2 tourists for each of Bali's 4.2 million residents. Napa has about 3 million tourists, equating to 21.4 tourists for each of its 140 thousand residents. Maybe that's why some Napans get more worked up over the impacts of tourism than the Balinese seem to. And this YouTube video: Bali Water Crisis - The Time to Act Is NOW! Solutions to Bali's problems are being proposed that depend on retaining more of the substantial rainfall in the groundwater aquifer. That is not an option here. Given our modest and dwindling rainfall such technical solutions are less likely. The impact of increasing tourism and urbanization, along with the expansion of vineyards, have the potential to present a similar significant crisis as the development boom continues. The comparison of the two tourist economies and the impact on water is well worth a look, particularly in light of the scant concern given to future tourism development in the WICC report the county has penned to submit under the State's Sustainable Groundwater Management Act, to be presented to the BOS on Dec 13th, Item 9A here. Thank you for your ongoing assistance with the Bremer Family Winery problem. I am requesting you deny the application to modify the approved Erosion Control Plan (P11-00317ECPA) which was submitted on 6-28-2016 as P16-00271. As you know, the existing foot print of the as built project differs from the approved plan. In addition your agency and RCD have documented failure to implement critical conditions of approval, which have resulted in erosion off project site and sediments entering creek channel. The Bremer's were red tagged by your staff on 6-27-2016 for failure to remove trellis within creek set back, despite their assurance that this had been completed. The list of non-compliance issues is lengthy and well documented in file, including letter from County Council. Currently the California Department of Fish and Wildlife is investigating the denuding of creek under the stream bank alteration program. Further, a public records request to the Agricultural Commissioners office documented a failure to submit required monthly pesticide use reports. Your files document herbicide strip spray in violation of conditions of approval, which is a critical element of the temporary erosion control measures. The project site is near sensitive receptors that are being negatively impacted by the importation of dirt spoils. The spoils haul route requires trucking thru the small community of Deer Park and requires dump trucks to pass directly by the Foothills Elementary School, the Adventist Community Services Center and is a block from both St. Helena Hospital and Health Center and the entirely senior citizen occupied Munds Mobile Manor, and the Deer Park Community Hall utilized by church and youth groups. The modification must be rejected and a full Environmental Impact Report must be conducted to evaluate the impacts on biological resources, geologic hazards, changes to hydrology, ground water, traffic impacts, air quality impacts and green house gas emissions. The project is additionally subject to View Shed ordnance and tree clearing required to accommodate proposed terraces warrants additional biological assessments. Known flooding in the area of Deer Park Rd. could be exacerbated and potential spoils contamination into Canon Creek must be analyzed. Lastly, modification of the existing Erosion Control Plan constitutes piecemealing as applicant fully anticipated multiple project phases that were not evaluated in the initial study, and has submitted modifications after the fact on at least one occasion. The original project evaluated under the initial study is vastly different that the proposed project build out and did not evaluate the proposed trucking of an additional 45,000 cubic yards of potentially contaminated spoils. I request the modification P11-00317 be denied and an Environmental Impact Report including the scope of the entire project be conducted. Napa County Planning Director Morrison has reached a tentative decision on the Walt Ranch Erosion Control Plan: The "reduced intensity alternative" will be approved. There were 3 alternatives being considered in addition to the Mitigated Project represented by the Final EIR - the "No Project Alternative", the "Reduced Intensity Alternative (RIA)", the "Multiple Resource Protection Alternative". The RIA will represent a reduction from 500 acres down to 400 acres of gross development area from the mitigated project. I have had a very hard time actually seeing what the differences in these alternatives meant for the physical development of the property (beyond the never-considered "no project alternative", of course.) There may be a clear summation in map and table form of the differences in the thousands of pages of documents for the project but I couldn't find them even with Dir. Morrison's hints. I assume that somewhat fewer of the "specimen" oaks will be bulldozed down. In looking at the photo of the Walt Ranch property shown here, it is finally apparent to me why the vineyard blocks on most of the site are linear meandering beads - each of the ridgelines is to be given a flat top. What else could they do given a landscape that is really too mountainous to develop efficiently? A house or winery can now be placed on each of the promontories. And in time they will be. Looking at this photo gives a sense of the loss of a great opportunity for the preservation of native Napa woodlands for future generations - 2300 acre properties of such character do not come along every day. For such a vast area to be turned into a gated community for 35 plutocrats is truly sad. The Halls paid $8 million for the property. I can't help wondering, given a new level of community consciousness in the county, if the same property came up for sale today a way might not have been found to add it to the public trust. It is worth noting this co-incident article on the preservation of 1500 acres of land on the east edge of Berryessa to see what owners who understand the value of the natural environment have done to secure the rural character of Napa county for future generations. As reported in the NapaVision2050 newsletter, the Water, Forest, & Oak Woodland Protection Initiative of 2016 has been given a TKO by the Napa County Council for not including the complete text of an appendix referred to in the initiative. He had many weeks to alert the initiative sponsors of the discrepancy, but decided to wait until the initiative was ready to be certified by the County Registrar of Voters before killing it. This is a sad day for the 6300 signatories who wanted to see this issue to be voted upon, along with all others who might wish to slow down the conversion of our natural landscape to more financially profitable use. Read all about it here, and in the NVR here. Alfredo Pedroza has been elected Supervisor for District 4. His opponents, Diane Shepp and Chris Malan, built their campaigns on the protection of the watersheds from the development that is currently taking place in the county. Sup. Pedroza has made a point in his campaign literature of wishing to protect the County's natural beauty and the character of its rural communities at the same time emphasizing the importance of creating jobs and a stronger economy. Jobs and a growth economy represent what Napa has gone through in the last 2 decades and the natural beauty of the county has been clear cut for vines, traffic has become unbearable and unwanted tourist attractions and other building projects have been popping up in the backyards of all of the county's rural communities. It is a bit of a zero sum game. If the goal is ever more jobs and an ever increasing economy (driven by increased profitability of land use), then protecting the natural environment and rural character becomes ever harder to achieve. Sup. Pedroza is obviously a gifted public servant. I hope that he succeeds in both his goals, but I fear the the success of one means the sacrifice of the other, and, you know, those campaign contributions from the growth-oriented among us are hard to ignore. Update 6/10/16: the night sky is disappearing along with the West. 80% of Americans can no longer see the Milky Way. We on Soda Canyon are among the 20% who may still view the Milky Way at night (and passing satellites) but probably not for long as the urban development continues. It was quite interesting to note in the article that Sedona, Ariz. has become an international dark sky area - it is possible to stop the pollution if communities and their governments have the will. The loss of natural landscape to agriculture, particularly to the life-style recreational agriculture that is now consuming more and more of the forested hillsides of Napa County, needs to be weighed against the value that undeveloped land provides for the sustainability of our species, other species, and for the nourishment of our souls. All something to think about considering the 2300 acres of natural habitat that are about to be consumed by vineyards and roads and future building sites at Walt Ranch, shown here. The ease of placing tax initiatives on the ballot, the democratization of public fiscal responsibility in the face of representative incapability, is a long term disaster in a nation where 40% [oops, 46.1%] of the voting population would vote for Donald Trump. The system insures that we now have tax fatigue at every election and public resources that really need common funding are denied by dazed or brain-dead voters automatically pressing the no button. "No more taxes" grunts Savethechildren in commenting on the open-space article. Most know that the wealthy have armies to insure that the tax code benefits them. Why should the commoner have to pay for the wealthy disinterest in the common good. Such a system requires an electorate that is concerned about the common good and is willing to sacrifice self-interest for it, despite the knowledge that the wealthy will sacrifice as little as possible. That is an increasingly high bar for the American voter. � A total of 110,000 new marketing visitors are also proposed. � There are several clusters of pending wineries, generally located near Calistoga, Pritchard Hill, Yountville, and Soda Canyon. During the second APAC meeting, I testified that its work ought to begin with a comprehensive review of overall data and that such data be used as the basis for setting its agenda. Although you had presented many of these data at the March 10 town hall meeting, this did not happen. I am most appreciative of the fact that you now have begun assembling such data on pending application as the ones below. What is now needed is the generation of a second tier of data derived from them which is something I hope you will undertake before the APAC deliberations by the Supervisors are concluded if their decisions are to be based on facts rather than on the agendas of a variety of factions and special interests.. Using the 2.9 million gallons in new production, the applicable 75% rule and a grape yield of 2.5 tons per hillside acre, the acreage which will be required in the Napa valley to satisfy this production is 6,000. I use hillside acre numbers because as we all know, all valley floor acreage has been utilized already. As all grapes grown in the Napa valley are being utilized under current production, there is no doubt that that acreage will be required. As a matter of fact, several thousand additional acres will be required if the unutilized existing use permit production numbers are to come on line. As an example, the Summers winery which produces 32,000 gallons on a use permit of 50,000 gallons is seeking approval for 100,000 gallons. 6 gallons of water per gallon of production results in 17.4 million gallons of water in the winery, plus 2.2 million gallons in vineyard irrigation at the rate of 110 gallons of water, equals 242 million gallons for a total of 260 million gallons of water. These staggering numbers are for pending applications only. They are plainly unimaginable going forward even just 5 or 10 years. A further derivative analysis APAC should have made regarding future water requirements and traffic impacts from the 677,000 visitors and workers (commuters) as well as new hotel accommodations to house the visitors who typically require 2 employees (commuters) per room and generate 12-15 vehicle trips per day per room is imperative if we want to begin to have a serious picture of water requirements and traffic impacts in the immediate future and under current County approval practices. We are looking at perhaps as many as an additional 30 - 50 million gallons of water and staggering traffic numbers. The above figures alone make it abundantly clear that the APAC recommendations even if all were to be approved, will have no effect on stemming the enormous forces which are on a course to strain the Napa valley resources to the brink. It is time for the Supervisors to face the real challenges by engaging in a new policy model based on numbers as you have laid them out and their derivatives. Once again, we are talking here of pending applications alone! We have another deforestation plan for Howell Mtn, 1260 Summit Lake in Angwin. No Cal Fire number given yet, but just the NOP for Ciminelli Estate Vineyard Conversion for approx 17 more acres. The APN # is 018-230-002. Just to be sure, this is in addition to the Davis Friesen Lakes THP already in process. And to make matters worse, the $man behind this appears to be a suspected crook from Buffalo New York. These cumulative effects will never be taken into consideration without someone ( many people) screaming bloody murder. Maybe then, maybe never. I'm pretty discouraged after what's going on for Rector and of course, Milliken, Bell, and Hennesy. Assuming the watershed is the Napa River, remember that the THP/TCP is the target CEQA doc. CEQA timelines are essential in stopping and/or mitigation of the environmental impacts. Northern Spotted Owl, NSO, is �the target specie for significant cumulative impacts to habitat. If this is above a dam steelhead are harder to make a cumulative impact analysis on but it can be done and should be. �I recommend you start early and bring in the best expert(s) and attorney on: sediment/water quality; hydrologic changes and species impacts-as these have held in prior court cases. This is your best approach for significant cumulative impacts per project in this watershed. I do not profess to be an expert on global warming or its causes, nor do I think it is productive to just single it out as the one factor by which to evaluate whether deforestation in favor of vineyards or agriculture is beneficial or detrimental to the environment and the longterm health of communities. But I do know my history. And it is full of examples with plenty of warnings which are downright dangerous, though convenient to ignore. We can start with today's environmental wasteland we call the Middle East, which is recognized as the cradle of our civilization when it was known by a different name: The Fertile Crescent. It is an area where over the course of 3,000 years, the Phoenicians, Romans, Ottomans and the British managed to virtually wipe out its magnificent 150-foot-tall forests known as the Cedars of Lebanon to build from ships to railroad tracks and convert land to agricultural uses until its changed climate decimated its entire ecosystem not just for these but for all uses. The denuded mountains of the Levant were left to face flash floods with nothing but eroding slopes. In recognition of this environmental catastrophe, an international reforestation program was begun in 1985. Yet here, we are debating whether steadily moving in the opposite direction is the right one. In his acclaimed book "Collapse, How Societies Choose to Fail or Succeed," noted Pulitzer Prize winner Jared Diamond has outlined the socioeconomic collapse of Easter Island due to deforestation, and one need only look at an aerial photograph of the Dominican Republic, a thriving country and its poverty stricken neighbor Haiti to recognize the cause obvious to any thinking person: Thriving forests on the one and a moon landscape on the other, sharply divided from each other by a precise line as if cut by a knife. Carbon sequestration calculations may be one thing but common sense dictates that rain falling over a forest falls slowly on the ground and shaded by its canopy gets a chance to penetrate into the ground before it evaporates. And common sense dictates that when rain pounds on the soil of leafless, winter vineyards, it runs off before it has a chance to replenish the water table. That run-off, even under the best erosion control practices, carries with it top soil and silt into the streams and ends up in the ocean. In answer to Supervisor Luce's concern on whether we may be missing something in converting forests to vineyards, we need to admit that we are doing so in support of an economic model. But trying to rationalize this practice as the best option is quite another and it is disingenuous. The difficult decisions Supervisors are burdened with are ones of right balance, not of rationalizing accommodation of special interests. The public is beginning to sense that we are at a tipping point and that failure of leadership to stem the steady degradation of the fundamental elements of our ecosystem are beginning to show in our overburdened infrastructure and the deterioration in everyone's quality of life. The deadline to protest THP 1-15-081 NAP is October 5th. Note yesterday's Register report of unsafe drinking water being found in downtown Napa taps.� Milliken's water, according to Eldredge, is by far the City's best water, needing just a "dab" of polymer.� Will we allow it to be destroyed? 3:30 PM - City Council meeting - public comment thanking council members for their unanimous support of staff recommendations. Below is additional information to support our case, if you like. �Establish a revised County Ordinance to increase restrictions on development in sensitive watershed areas to limit the water quality impacts to the watershed. Require development in watershed to monitor the creek water quality upstream and downstream of the project runoff and submit data directly to the Water Division. I'd like to immediately start working with the County to strengthen their code and discuss appropriate zoning for municipal watersheds.� We are justifiably concerned about our local source of water, and where are we going to go from here?� I support, agree with all of the speakers who mentioned this tonight except maybe with Mr. Reynolds, there might be a few things I disagree with his statements.� It's time we need to move ahead on this and we need to move forward quickly. Techel:� The phone call tomorrow shows the urgency of how the Council feels about this.� That beats waiting two weeks for a resolution. I'm going to argue we're taking the urgent action here.� We're asking our expert what we should do right now and she's given us a list of things to do in the next couple of years.� And I think we should focus on doing these things instead of just saying how we feel [resolution]. Implement recommendations and update the Watershed Sanitary Survey as required every five years and review baseline data, identify changes to water quality, reasons for water quality changes and make recommendations for mitigating and restoring water quality. Update the Municipal Code to authorize financial penalties for violations of unauthorized watershed recreational uses. Impose mitigation measures on development in sensitive watershed areas that is shown to degrade water quality in order to contribute to watershed protection investments and water treatment improvements. Here's an update on our City watershed protection efforts. A good cross section of the community presented to the City Council on Tuesday. Bottom line, we'll need a plan to continue to bring awareness to this issue and to request progress reports from the City and the County. Do you have ideas on how we can do this effectively? Register article on Tuesday's City Council meeting (agenda item 14A here): What Yune doesn't say is that the other council members (Inman absent) wouldn't support a resolution proposed by Sedgley. I have the transcript if anyone needs to see it. I spoke to Scott Sedgley Thursday. He said he had talked about better protections for the municipal watersheds with Pedroza and was preparing to talk to Dodd about it. He doesn't want it to take two years to get the ordinance revised. He's going to work on the BOS including Dillon. An initiative might be the solution. It would receive the support of most Napans. It's so obvious what Hall's business model is! I also spoke to Joy Eldredge. She called the County at 08:13 on Wednesday to set up a staff meeting and hadn't heard back. She says her goal is to raise awareness. You folks are doing that a lot. It's interesting to see people speaking at every meeting. The passion is good to see. Scott said, Think of the AP, people were opposed to it. People will say NO to better protections for Milliken and Hennessey, it will not always be popular. As the Council knows, the City does not have the land use authority to unilaterally adopt ordinances, condition development, or impose mitigation measures on land use development within the unincorporated area. However, the County remains open and available for inter-agency discussions on these topics and other areas of mutual interest that impact the broader community. I'd like to immediately start working with the County to strengthen their code and discuss appropriate zoning for municipal watersheds. We are justifiably concerned about our local source of water, and where are we going to go from here? I support, agree with all of the speakers who mentioned this tonight except maybe with Mr. Reynolds, there might be a few things I disagree with his statements. It's time we need to move ahead on this and we need to move forward quickly. The cumulative impacts of these projects are greatly impacting our community, and I agree with all of the short-term and long-term solutions that were presented tonight. Our Water Department's done a great job over the years really managing our water supply and making sure we make smart critical moves to make sure we have a good water supply. Part of that is what's being proposed here, and I think these are very prudent moves. I'm fully supportive of the measures here, and we can talk about the long-term measures and their time frames. Techel: I was encouraged that we got a memo today from the Planning Director of the County. And in this letter, he mentions he is open and available to have discussions on this topic. We're going to need to work with the County, and we're going to have to marry what the City's interests are with the County's processes, because these processes are in the county. I appreciate your report, I appreciate the different strategies you put out, and I encourage you to make a phone call tomorrow to say yeah, let's start the conversation going forward. The County staff is evaluating the City's comments on both projects. With regards to the WALT Ranch, it's expected that the FEIR, including responses to the City's comments, will be available for public review around the end of October. I encourage the Council to defer discussion of any specifics regarding items of either pending proposal [WALT or Kongsgaard] until the County has had an opportunity to complete its analysis and formally respond to the City's concerns. Reynolds went on to tell the Council that the project intends to reduce the sedimentation on the Milliken side by 43% over current levels. The issue of protecting our watersheds - I think we need to take a more proactive - a more aggressive - and I sincerely believe in working with the County and talking to the county and trying to convey to them this urgency in our watersheds, and in a greater sense the county's watersheds in their entirety. I think a good way to do that is to create a resolution that says we are serious about this and let's get to work on this. Techel: The phone call tomorrow shows the urgency of how the Council feels about this. That beats waiting two weeks for a resolution. I'm going to argue we're taking the urgent action here. We're asking our expert what we should do right now and she's given us a list of things to do in the next couple of years. And I think we should focus on doing these things instead of just saying how we feel [resolution]. Update the Watershed Sanitary Survey as required every five years in 2017 and review baseline data, identify changes to water quality, reasons for water quality changes and make recommendations for mitigating and restoring water quality. Continue to gather water quality data at the creek inlets to determine the amounts of phosphates, nitrogen and nutrients being introduced into Lake Hennessey and Milliken Reservoir today and monitor any increases in the future. Continue to clear brush on City watershed property and restrict public access to trails when fire danger is elevated. A fire in either watershed may render the water supply unusable. An influx of organic matter charred trees and natural matter washed into the supply makes the water treatment process unable to treat to today�s drinking water standards. The Lake Hennessey Reservoir has been used for recreational purposes including fishing and boating. Bodily contact has been prohibited for over 30 years. The threats to water quality associated with recreation are personal care and pharmaceutical products (PCPPs) in the water, increased fire danger, petroleum and hydrocarbons from motorized boats, and the introduction of invasive species in the water. Bodily contact has been prohibited for decades, yet watershed caretakers remove individuals throughout the summer season for not obeying the clearly posted rules. Goal: Issue monetary fines to dissuade violators from not respecting the posted rules. Boating is permitted on the lake to include motor boats and canoes. Goal: Restrict the types of boats on the lake to a maximum of 10hP motor and prohibit boats with two-stroke motors on the lake. Invasive species such as the Quagga Mussel and the New Zealand mud snail are very real threats to municipal water supplies. The invertebrates, once introduced into the water body reproduce uncontrollably as they filter all nutrients from the water, clog intakes and prevent the pumping of water to the treatment process. The New Zealand mud snail has been discovered in nearby Putah Creek downstream of Lake Berryessa. 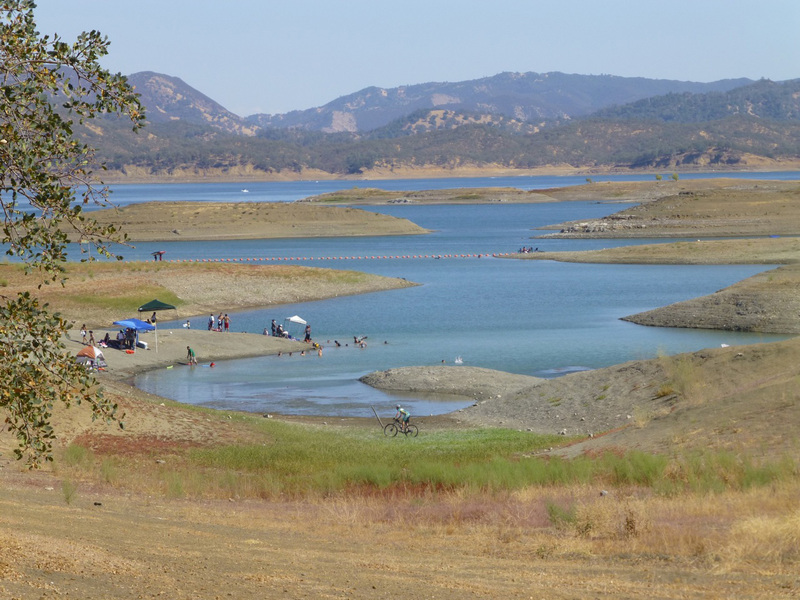 Many boaters that recreate in Lake Hennessey also visit Lake Berryessa. Goal: reduce number of large boats that visit multiple reservoirs, post self-inspection information prior to launch, require CA Department of Fish and Wildlife certification of invasive species awareness with boater registration. ProtectRuralNapa's own Amber Manfree has published an extensive blog post on the restoration of the Napa River in the Rutherford reach area of the valley. She is also co-author of the book Suisun Marsh: Ecological History and Possible Futures and has been awarded the UC Davis Kinsella Memorial Prize for her dissertation on the Suisun marsh. Well Drilling logs are now public documents - Except the Owners Name and Address???? The property rights team is hanging on by a thread. After Will Parrish�s article Water Into Wine you asked what are the fish of Napa River? While the Napa River has a unique assemblage of 14 native fish such as: Steelhead trout, Chinook salmon, Sacramento sucker, prickly sculpin, riffle sculpin, Pacific staghorn sculpin, pacific lamprey, threespine stickleback, hardhead, Sacramento pike minnow, Califormia roach, tule perch, Sacramento splittail, white sturgeon, unfortunately we have 13 exotic fish-or non-native. The Napa River is all but lost cold water aquatics beginning with endangered Coho Salmon in the 1950�s and extirpated by 1970�s. Few streams in California now have Coho due to human impacts such as deforestation. This is a very sensitive specie to turbidity, temperature and sediment. Large scale deforestation started at the turn of the 19th century and continues today due to conversion of our landscape to vines, roads, houses etc. After the 1906 earthquake, San Francisco was rebuilt by logging redwoods which put massive sediment into coastal streams including the Napa River. Chinook are all but gone due to loss of habitat and water quality and Steelhead a more resilient species hangs on by a thread. Western pond turtle and California Freshwater shrimp are fast loosing their few remaining habitats as the Napa River continues to incise due to: levees and deforestation, increased rate of runoff from ECPAs, culverts etc. Now dewatering (vines, dams, marijuana) is killing off most all species and stressing terrestrial wildlife. CEQA and the ESA and CESA are legal hammers to help these animals. Clean Water Act and Porter Cologne Act also legal tools. The first meeting of a Technical Advisory Group organized to plan for the restoration of the upper Napa River met Friday, May 1st at the California Department of Fish and Wildlife offices in Yountville. The conceptual plan, or �Upper Napa River Habitat and Sediment Reduction Plan� seeks to restore approximately 5 miles of river habitat or ten �reaches� along the Napa River ranging from Big Tree Lane north to Lincoln Avenue in downtown Calistoga. Made possible by a grant received by the California Land Stewardship Institute from the State Water Resources Control Board and the U.S. Environmental Protection Agency under the Federal Nonpoint Source Pollution Control Program, the Napa County Resource Conservation District will act as the sub-contractor responsible for the fisheries component of the plan with Storesund Consulting responsible for geomorphological components. Engineering, fisheries, and riparian ecological studies were discussed at the May meeting which included representatives from federal and state regulatory agencies, environmental organizations, the County of Napa, and City of Calistoga. Similar to what has been done in Rutherford and Oakville, planners hope to work collaboratively with private landowners in an effort to restore water quality and the aquatic habitat of the river. Recreating floodplains and riverside habitat, the restoration may involve converting 15-20 acres to natural habitat and assist in protecting property from future erosion and floods as well as enabling the restoration of Napa River fisheries. The upper Napa River and many tributaries in Napa County historically supported large numbers of migratory species including steelhead trout, chinook salmon, and coho salmon. Unfortunately, their populations have declined sharply in the past several decades. Coho salmon became extinct in the Napa River watersheds in the 1960's. Steelhead were listed as threatened in Napa County in 1997 under the Endangered Species Act. A small Chinook salmon run still exists in the Napa River, but it is not clear whether they are wild fish or strays from hatcheries in the Sacramento or San Joaquin River systems. According to the Napa County RCD, improving and expanding habitat for steelhead and chinook salmon is a top priority in the Napa River watershed. The film features the Russian River and the impact of the ignorance, exploitation and neglect of it, particularly by commerce and agriculture. It should be required viewing for every governing official, vintner and voting citizen. It is particularly pertinent for those of us who live here in the Napa Valley and are concerned about its environmental future. I raised my sons through their early years on that river. We learned her many moods: her rushing insistence in the winter which we could hear even as we drifted to sleep; the way she took the town, flooding homes and businesses alike, when the rains went on for too long. Sewage spills upstream contaminated our wells for days after. The Press Democrat printed a picture of a Santa Rosa city official drinking a glass of treated water from the sewage treatment plant, showing how safe it was, a picture we scoffed at. These were war days: a battle of those downstream from those farther up. It was really a coming-into-consciousness of how much we impact each other. What is that old saying? � we all live downstream? �Russian River: All Rivers -- The Value of an American Watershed� is gripping in its scope: This is not just the Russian River, folks! It�s all rivers! If we keep up our ignorance of how we manage water, watersheds and rivers, we are going to be out of water! It is also a wake-up call: There is still something to be done. This need not be a battle, but rather an awakening to the impact of our actions and a gathering of all sides to protect the commons: our land, our watersheds, our rivers, our air. This is not about property rights, right-to-farm, profit, tourism, individual entitlements: It is about survival. The documentary has several screenings, including a 7 p.m. screening on Wednesday, May 20, at Copia Center in Napa. Although there is no charge, there is a request for a donation at the door. You do need to make a reservation, however, as there is usually a full house. The screening is sponsored by Friends of the Napa River, Green Party of Napa County, Institute for Conservation Advocacy, Research & Education, Napa Vision 2050 Coalition. To reserve seats email reservationsmay20@russianriverallrivers.com. You might find this week's Center for Watershed Sciences blog on groundwater budgets of interest. Particularly in relation to the groundwater aspect of the WDO redefinition effort. The Sustainable Groundwater Management Act of 2014 creates an opportunity to establish standards for the way California accounts for its stores of groundwater, which provide up to 60 percent of the state�s water supply during droughts. The new law requires regional agencies to prepare Groundwater Sustainability Plans for �high� and �medium� priority groundwater basins, as designated by the California Department of Water Resources . It was good to see you this morning and hear your words in support of watershed awareness. You sparkled up there so I guess you're getting plenty of good clean water from somewhere! After you left we plugged our next screenings of Russian River/ All Rivers. It shows twice in Napa this month at Copia. Perhaps you could make one of them. I think you'll find it very informative and my hope is that as WICC Chair, you might be inspired to seek ways to provide greater protections for our own at-risk watersheds. May I suggest you invite others who serve on WICC, and other organizations committed to watershed health? Please take a minute to read the latest on loss of forest carbon sinks and sequestration in California. The science was published in March and Mother Jones just came out with this report on it. I spoke to it during public comment. We can and must do more to focus our efforts on avoided deforestation here at home. -Preventing the trucking of North Bay Aqueduct water (Sierra snow fall is 15% of normal) to supply the County with water for vines and wine where practices are not sustainable and demonstrate waste and unreasonable use, i.e., such as the Woolls winery project. The drought is compounding water quality problems existing in the Napa River watershed, pollution due to nutrient loading. Now the general public is seeing the environmental impacts from watershed degradation first hand or rather at the tap, our drinking water. If chemicals run into the reservoirs (pesticides, herbicides, biocides, fertilizers) where we get our drinking water, the water purification systems can be overwhelmed. In this particular situation the City of Napa can not achieve water quality standards for �biomass� control as evidenced that disinfecting by-products surpass Safe Drinking Water Act x2 for trip-halomethanes at three locations in Napa: a.) Darmes Ln. b.) Jackson Street c.)Browns Valley Ln. or 87,000 residents of Napa. Biomass can be algae, pathogens etc. 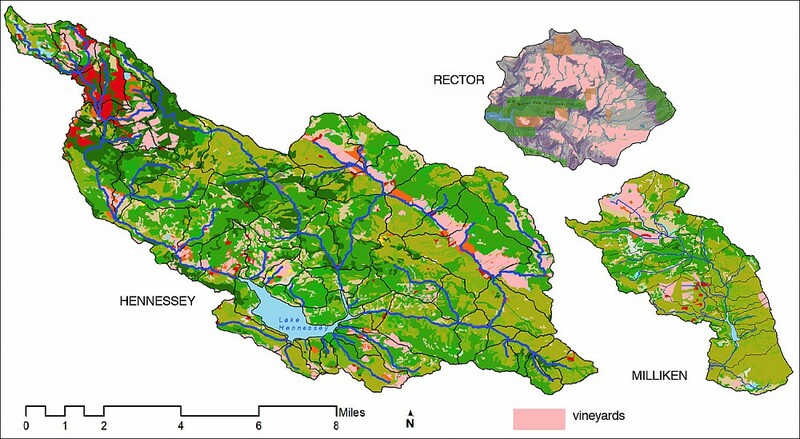 In the Hennessy Reservoir watershed, where the City gets most of its water, vineyards and cattle are the primary land use which both discharge bio-stimulatory agents (phosphorous) to the streams/river thereby-causing �biomass� accumulation beyond allowable loading. Suffice to say, we are polluting the Napa River and our drinking reservoirs from vineyards and cattle in the watersheds. Log on and get registered for Russian River: All Rivers and pass the word around asap. -excessive groundwater pumping- why not dry farm like Frogs Leap vineyards! -green lawns are a thing of the past�what about all the green golf courses! Note: California over allocation the States water long ago. There is not enough water for the population that lives here with normal precipitation and all rivers in California are loosing their normal flow patterns. This is a receipt for disaster. We really need to educate the public about our destructive lands practices so we can build a better future with a Green economy that is truly sustainable. RSVP for May 15 Watershed Symposium today! Tickets are going fast. I hope we fill the room with our Coalition members to ask the tough questions of true resiliency-forest, water, forest and soil protection and conservation. Keep in mind the RCD is the entity that developes erosion control plans and works directly with the vineyard developers to clear cut our watersheds and mitigate erosion. They are the front line/interface with the plans to install erosion control devices to mitigate forest extraction. Most all new vineyard development in Napa County is in the hillside environments. They need to hear from us how we feel about this practice in front of the politicians that are going to be there putting out accolades about how wonderful they are all doing about �Building Resiliency in Our Watershed�. I think letting them all know how concerned we are IN PUBLIC when ever possible is essential to building our political movement for sustainable growth given finite precious resources. 1. This Symposium is put on by the Resource Conservation District, RCD, whose mission is to work with farmers to improve soil conservation, and they get money from the San Francisco Regional Water Quality Control Board, SFRWQB: government serving government impressing upon the pubic a rosy picture of the great work going on to restore the Napa River. Keep in mind all of our consternation of vines marching to the ridge tops. The RCD is on contract by the BOS/County to-design erosion control plan applications, ECPA, for the development of vineyards; all new vineyards are in the hillside watersheds and the erosion control plans engineer sediment and water transported to the streams. This causes deep incision of the Napa River as water is diverted off the site of vineyard development and piped/diverted to the nearest stream. to rescue rich land owners who own vineyards along the River from the erosive flooding forces of the Napa River that are ripping through their vineyards: increased flooding on the valley floor is largely caused by deforestation by vineyards in the watershed directly related to erosion control plans that divert water off the vineyards and send it off vineyard site to the creek creating an increased rate of runoff which collapses stream banks (erosion) and incises the River creating steep banks and the river disconnects from the flood plain-hydrologic dis-equalibrium. I am hoping that Vision 2050 will have tough questions for these bureaucrats who are have not being honest about the watershed facts. This is an opportunity to educate the public about our concerns for watershed protection. Taxes for a better world? Not in Napa! As usual some people have no trouble spending vast amounts of tax money for a useless Maginot line between the US and Mexico or futile and tragic wars to secure middle eastern oil for the worlds largest corporations or to bail out egregious financial manipulators while so many were losing their homes or to give tax breaks to the most profitable corporations in the world or to fund the most Orwellian, and ineffectual, instrument ever created to spy on us all. But when it comes to the those things that are good about any civilization and that separate historical golden ages from the periods of war and poverty and ignorance that constitute most of human history - the support of education, of arts, of science, of the alleviation of poverty and illness, of the creation of a more enjoyable world to live in, a culture that a will be admired a thousand years hence - when it comes to those things that might define this as a golden age in human history, like a preservation of the natural beauty of this place for future generations to enjoy, whoa, NO NEW TAXES. The flier is here. No charge but you must reserve. As for Kongsgaard, I've read the Initial Study on the ECP. Cahill is recommending mitigated neg dec because she finds no potentially significant impacts. I think deforestation has a significant negative impact cumulatively especially, so we avoid it locally. The project calls for clearing 23 acres to net 17 acres of vineyard in five blocks. They overlay two watersheds off Atlas Peak Rd, Capell and Milliken. Sound familiar? Appx 8 acres of oak woodland are targeted. That's 553 oaks 6" bhd. The study meticulously counts trees for cutting down and trees to be left standing. I decided to call John Kongsgaard and we had a lengthy positive conversation yesterday. We know each other from UCD and went to high school with his sister. It's hard to cold-call a guy you like and admire and criticize his vineyard conversion plans. But I complimented him on the favorable parts of the study and offered to help him improve on the forest aspect. There's all this science about what forests do and must do now and it's not known or it's undervalued. Yet we don't have more than voluntary oak woodland protection in Napa. I want to make John a climate hero. He does that by avoiding deforestation. It's yesterday's science. Just like we don't smoke and eat Cheetos like we used to, now we don't burn gas and tear out trees. I want to find a way to help him to do that. Currently there is no "Forest-Friendly" certification. If I want to find a wine that's a deforestation-free wine, I can't. I want to give him the opportunity to be the leader we need to get going in the direction of a forest-safe wine. How can we encourage him? When others follow, we give them the Kongsgaard Forest Safe Champion Award. I know this is simplistic but where do we start? Find a way to get along with your forest. We're currently heading in the opposite direction in our county, with enormous pressure to expand vineyards into the forested hillsides surrounding the built-out valley floor. I'm going to comment on the Initial Study. Deadline is 4/15. I think it's important to get something on there on biology and GHG. The Kongsgaard project is <1/2 mile west of WALT. Napa County Watershed Symposium 2015 features an all-star line-up. The goal of the event is to bring a diversity of stakeholders in the same room to spark creative plans and collaborative actions to improve our watersheds� resiliency. Here is a gathering of all the leading watershed (manipulators of funds for restoration) players regionally and locally- government folks. With Prop 1 and Prop 84 it is all about restoring the watersheds and monitoring groundwater at the tune of big bucks! However, there are NO funds for watershed enforcement protection and smart land use for finite resources because the bonds (written by government) are for restoration. The legislature doesn�t develop enforcement and forest protection bonds. We should be packing this symposium and let the public know our thoughts about the use of tax dollars for restoration project that do NOTHING for the causes of the degradation of our watersheds and ultimately our climate. Code enforcement is lacking severely and deforestation prevails. Water, the driver for all development is tightly controlled by the SWRCB who only steps in during severe drought, allows rampant over allocations of our water supplies, lacks enforcement, and squanders our resource to the water buffalos/big ag. 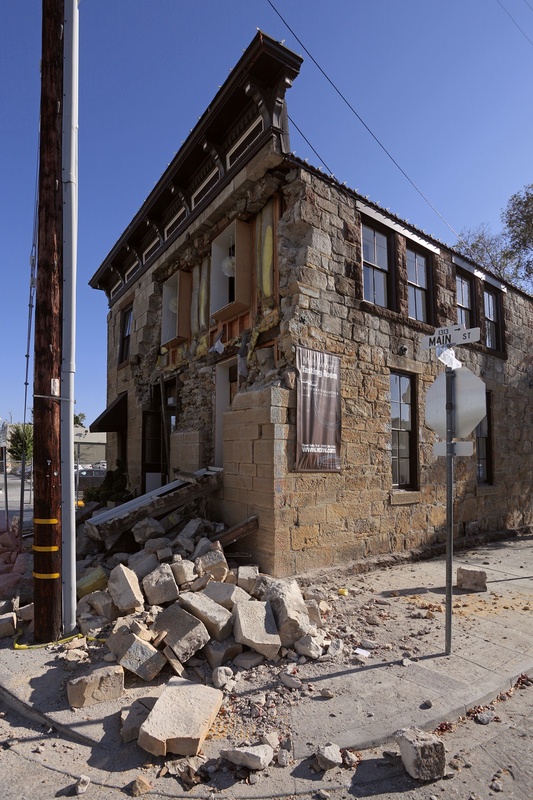 Small restoration projects not government affiliated in Napa are next to impossible to get (spoken from experience). I'm registered and will see you there. Note: There a couple of good articles in yesterday's SF Chron on CA's antiquated water rights system and water use by agribusiness. See especially, "California Water Law Must Change -- Quickly" By Richard Frank of the UC Davis School of Law, page E6. Also: I've been thinking that the Russian River film screenings in Napa could be the start of a series of public education talks featuring experts such as R. Frank or others from the UC Davis Center for Watershed Sciences. CSU, Chico has courted faculty especially focused on sustainability which could also be utilized, as it is attempting to become the "Green Campus of the CSUC system". I understand Felix E. Smith of Sacramento, an authority on the public trust doctrine, still lectures ~ and passionately ~ like most San Francisco-born Italian-Americans who have witnessed the demise of state fisheries in their lifetime. Patrick Porgens could speak on the State Water Project. Etc. etc. A weekly lecture series could assist in drowning out manipulation and amplifying logic and ethics. We must Use The Drought to capture the public's interest ~ before they tune back into Dancing With The Stars. California Water Restrictions MUST Include Big Ag, Big Oil and Nestl�! Does Napa consider itself to have a problem? In our meeting with Diane Dillon last month she told us she thought Jill Techel doesn't get the gravity of the situation. 1. How much of Napa wine production is owned by foreigners? 2. How much of Napa wine is exported out of the watershed, out of state, out of country? I think we should know the numbers. Frackers and bottled water exporters are targets for censure, as they should be. Who else? Donald and I attended the "super duper growing coalition" meeting in Jenner yesterday. Will Parrish seemed to have the numbers on your question. Or perhaps the Wine Institute in SF? on their "Statistics" page? This email is being provided to keep you informed about proposed updates to Napa County�s Water Availability Analysis (WAA) Policy. On January 7, 2015 the County Planning Commission received a presentation by County staff and took comments from the public on proposed updates to the County�s WAA Policy. Plans are to return to the Planning Commission on April 1, 2015 with a revised update to the WAA Policy for the Commission�s discussion and consideration. Information on the background and applicability of the WAA Policy is provided below. A list of all comments received along with proposed responses and a revised draft of the WAA Policy with tracked changes from the previous public version are available at: http://www.countyofnapa.org/PBES/WAA. Any further written comments received by March 24, 2015 will be included in the Planning Commission�s April 1, 2015 agenda packet. Thank you again for all your input! If you have questions, need more information, or want to provide comments on the current working-draft of the Water Availability Analysis (WAA) Policy update, please contact Steve Lederer at (707) 707-253-4351 (steven.lederer@countyofnapa.org) or Patrick Lowe at (707) 259-5937 (patrick.lowe@countyofnapa.org). This year's snow pack in the Sierra is just 12% of normal. With several years of drought already, that means that the State Water Board is not going to be able to supply sustainable amounts of water to Napa�s cities. Water supply is going to be on everyone�s mind as we try to figure out how to survive. 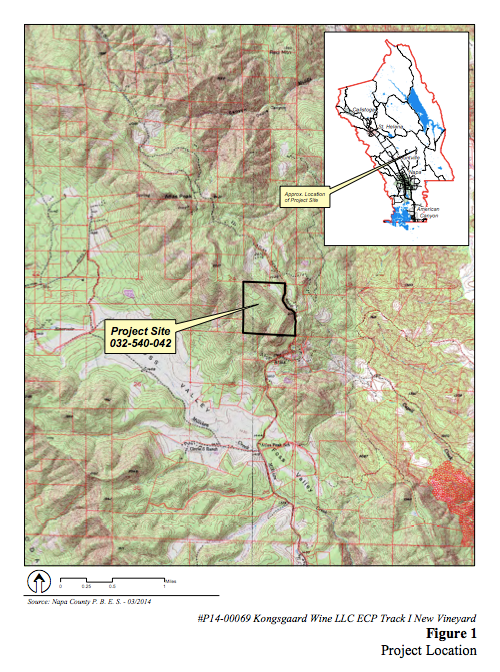 American Canyon is seeking to �buy� a reservoir! The health of our Napa watersheds, including the Milliken, Sarco, Tulocay, influences your life. Healthy watersheds provide the ground water that rural residents of the county rely upon. Learn about the assault taking place on our watersheds by attending this important movie on March 4. The event is being sponsored by The Defenders of the East Napa Watersheds and the tickets are free. Reserve your ticket via email. The doors will open at 5:15 and the film starts at 5:45�we know it�s an awkward time but it�s the only time they could fit us in. The Napa County Board of Supervisors is holding a meeting on March 10 to discuss key issues such as traffic, the WDO etc. We need to make sure that water and our watersheds are on that Agenda. We need to make sure that our watersheds are not allowed to be removed to make way for vineyards. An interesting little note about the North Bay Watersheds Association and who will be chosen from the Flood Control to represent their interests in the Association. The attached Agenda letter tells all, but it certainly affords any Watershed Group or Concerned Citizens to make recommendations to the District. Who do you think would be a good rep?? Alfredo, Garcia, Dunsford ?? You can view their statements and gain their email addresses. The video of their presentations + Luce, gives you a good idea of their experience. Caldwell voted for Luce. Luce was picked due to his long history of involvement with the MTC and NC trasportation history and issues, which was paramount, Yountville and AmCan have a relatively short history with the MTC. I never thought of using this issue as an into, so a little reading will help for an intro. There's a very well-written book about the history of open space preservation in California called Saving Open Space that covers the subjects of land conservation and preservation. It delves into the many forces working for and against open space, and a variety of the methods that have succeeded in slowing and stopping development. For the deep-thinking strategists among you: A Tale of Two Valleys: Wine, Wealth, and the Battle for the Good Life in Napa and Sonoma Counties. My perspective differs from the author's somewhat, but this book offers succinct, direct comparisons between the sister counties. Both of these books cost practically nothing used on Amazon, and they offer some good perspective. Our area is home to a stunning array of species, some of which are classified sensitive (SE), endangered (EN), or have Species of Special Concern (SSC) status. This morning, I was startled to see a bald eagle (CESA EN, delisted federally) circling over my grandmother's house. I've seen golden eagles (SE) before, but that snowy head and tail were a big, happy surprise. We also have river otters, yellow-legged frogs (SSC), rainbow trout/ steelhead, pond turtles (SSC), six salamander species, and hollyleaf ceanothus (CNPS 1B.2). Soda Creek has been identified as the second-best spawning habitat for salmonids in Napa County, after Dry Creek. Rector Creek would be at least as good for salmon if not for the dam but, even so, it's a vibrant and resilient waterway with resident rainbow trout and a top-notch array of aquatic species from peltoperlid mayflies to American dippers. The Soda-Rector drainages are designated as a Priority Conservation Area by The Nature Conservancy, due to the combination of a high rate of endemic species and the imminent threat of habitat destruction and, of course, is part of the California Floristic Province, recognized as a region of global significance for endemism and diversity. We have a lot worth saving beyond our own immediate quality of life, and I think there's room for the species-based conservation perspective in our quiver. The James Conaway book on the hillside preservation battles prior to 2001 (in which Chris Malan features prominently) is also an important historical context for the watershed issues we now face. I, too, saw the same bald eagle Amber saw last weekend shooting straight up Rector Canyon, the first one I've seen since we've been here. Oak savannas, woodlands, forests, and the grassland and riparian systems that complement them are California�s most biologically diverse ecosystems and integral parts of the state�s cultural and historical heritage. 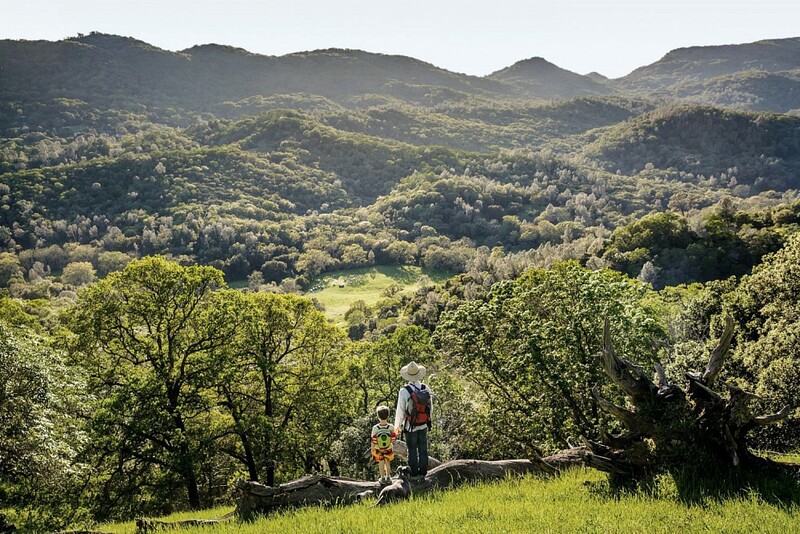 Santa Barbara County is fortunate to retain a significant, though reduced, distribution of the oak habitats that once blanketed the Central Coast. Oak habitats contribute greatly to the ecological diversity of California. In terms of species diversity, California�s native oak woodlands provide habitat for approximately 2,000 species of plants, 170 birds, 100 mammals (approximately one-third of all mammals native to California), 60 amphibians and reptiles, and 5,000 species of insects (University of California 1993 and 1996). These species include eagles, owls, hawks, reptiles, bobcats, foxes, deer, and 300 or more other vertebrate species that depend on oak habitats during their breeding seasons. In terms of ecological function, intact oak habitats stabilize the soil on which they occur, serving to help prevent the erosion of topsoil and protect water quality. Oak trees also provide shade, influencing the temperature and growth conditions for understory species. The community of oak-associated plants, vertebrates, invertebrates, and soil microbes varies from site to site, in response to site-specific conditions and the extent of influence by the dominant oaks. Within these communities, structural complexity is enhanced by the presence of riparian areas, downed and woody debris, snags, and diverse ages and conditions in oaks and other plants (Merrick et al. 1999). California�s oaks are also important for their aesthetic, economic, historical, and cultural values. Oak trees and their habitats are woven into California and Santa Barbara County�s cultural heritage, beginning with the indigenous peoples that utilized oak tree products and valued the oak woodlands in their cultural traditions. After European settlement in California, oak habitats have continued to be an enduring symbol of the state�s rich ranching tradition, and to be valued economically and aesthetically. The presence of oak trees on a property can increase the property�s value by 20% or more (University of California 1993). They are one of the county�s and the state�s most widely recognized and admired visual assets. In both the urban and rural areas of Santa Barbara County, oak woodlands and large, individual oak trees contribute significantly to the scenic beauty for which the county is known. This email is being provided to inform you of proposed updates to Napa County�s Water Availability Analysis (WAA) Policy. On January 7, 2015 the County Planning Commission received a presentation by County staff and took comments from the public on proposed updates to the County�s WAA Policy. To provide adequate time for the County to review and respond to the excellent input received, plans are to return to the Planning Commission on March 18th. On or before February 20th a list of all the comments received along with proposed responses will be published along with a revised draft of the WAA Policy with tracked changes from the previous public version. Any further written comments received by March 10th will be included in the Planning Commission�s March 18th agenda packet. Thank you again for all your input! Please check http://www.countyofnapa.org/PBES/WAA for future updates and announcements. While not directly related to the WAA Policy, you may also be interested in attending two upcoming meetings. On March 3rd, the Board of Supervisors will hear an update regarding current groundwater conditions based on latest well monitoring data, as well as an update on implementation of recent state legislation on groundwater. On March 10th the Board of Supervisors and Planning Commission are scheduled to conduct a joint hearing on future growth planning. Agendas for these meetings will be posted on www.countyofnapa.org about a week before each meeting. Defenders of the East Napa Watersheds (DENW) is sponsoring the showing of this movie on March 4. This is a great opportunity to show support for our watersheds and DENW. Per the info below, please send an email to reserve your tickets. The WAA (water availability analysis) required for all discretionary projects, is currently being revised by Steve Lederer and the NC Dept of Public Works. On Jan 7, they appeared before the NC Plan Comm with a Draft, and with additional comments, a final draft presentation for the Feb 4 Plan Comm . The link below has Item 10A, containing the Draft WAA and a list of FAQ. The FAQ has several determinations that are not discussed in the Draft WAA, so both are important. Sadly, there is only a one sentence mention of WATER QUALITY in the DRAFT. Contrast this with the attached document from GRAC and LSCE (Napa County Hydrologist), which has a healthy discussion of water quality and the needs for such in Napa County. Historical groundwater quality records are typically lacking in Napa County. From records that do exist, groundwater is generally of good quality throughout most subareas. Poor groundwater quality exists in the south and the north central parts of the county. The poor groundwater quality includes concentrations of metals such as arsenic, iron, and manganese that exceed drinking water standards throughout the county. Elevated levels of boron are also prevalent in most subareas. Subareas south of the Napa Valley Floor, such as Carneros, Napa River Marshes, and the Jameson/American Canyons, have poor quality water due to high levels of electrical conductivity (EC), total dissolved solids (TDS), and chloride. The Calistoga Subarea of the NapaValley Floor also has poor quality water in many wells due to hydrothermal conditions resulting in higher concentrations of metals. Nitrate concentrations are not generally a concern throughout the county, but nitrate levels tend to be higher in agricultural areas in the Napa Valley Floor. Available groundwater quality data in the county are incomplete in regards to spatial distribution, number, and record. Many subareas do not have sufficient spatial coverage to gain a full understanding of groundwater quality. Six subareas have ten or less wells with available groundwater quality data, which limits the ability to determine representative quality and some subareas have no historical data. As a result, without sufficient groundwater quality records, it is impossible to determine trends in many subareas.  Identify the natural and human factors that affect changes in water quality. A preliminary ranking and priorities for improving or expanding groundwater quality monitoring was prepared for each of the county subareas. Four subareas (including NVF-MST, Carneros, Jameson/American Canyon, and Pope Valley Subareas) are given a higher priority for improving the groundwater quality monitoring network based on factors of current and /or projected land uses and also the lack of spatially distributed groundwater quality monitoring. Three subareas, including Livermore Ranch, Southern Interior Valleys, and Western Mountains, are preliminarily assigned lower priorities for groundwater quality monitoring due to the likely lower levels of projected land and groundwater use. The ten remaining subareas are designated as medium priorities for groundwater quality monitoring. Many of these areas have current monitoring programs, so the emphasis in these areas is to further examine land use with respect to monitoring locations and the units(s) of the aquifer system represented by this monitoring. Many subareas outside the Napa Valley Floor have limited spatial distribution of the current groundwater quality monitoring wells/sites. Basic data are described as a key monitoring need to accomplish groundwater quality objectives. Importantly, expansion and/or refinement of groundwater quality monitoring conducted in all subareas should be coordinated with efforts to expand or refine groundwater level monitoring. This project led to a broader awareness of available groundwater data and an assessment of current groundwater conditions and trends, and also identified factors related to future assessment of groundwater availability. Spatial data coverage was good for some County subareas; however, for other subareas, monitoring network enhancements are needed. Recommendations are presented to enhance and expand countywide monitoring to facilitate understanding of groundwater availability and integrated regional water management and planning efforts. Section 6 of this report includes a table that summarizes the recommended implementation steps, including the implementation time frame, a relative estimated budget, and the relative priority for implementation. Why is the county reluctant to include water quality??? Industry objections on divulging sensitive data? The industry is not protecting and restoring surface water and groundwater quality to safeguard public and environmental health and secure water supplies for beneficial uses. Water Quality is very important and we must push these requirements into the WAA!! Otherwise the county is sticking its head in the sand and hoping it will go away. But this affects everyone in the same watershed: What is the original quality, how has it changed over time as affected by the pumping and irrigation? As the State is beginning to mandate these requirements in the new water laws, and water quality is the third rail of understanding the common resources under the ground, Napa County will be way behind as these regulations come into effect. Push now. Push Public Works, Plan Com and BOS. Otherwise we are going to be surprised by the cumulative impacts hidden below the ground. The Mt Veeder Group has been working on Water Issues and the Napa County Approach to their application. We are right there to review and comment on these applications to make sure that the neighbors, or all the county residents, other than the applicant and the Planning Department are represented and valued for their input into the process. Attached is our letter of comments to the 12/18/14 Draft of the WAA proposed changes.+ the WAA draft and the FAQ + the Staff analysis and proposed actions for the Plan Comm. Evangeline and I have completed much work on this draft, and we believe it needs inclusion of our comments into a new draft. If the current draft is accepted and passed on to the BOS then the Neighbors to Projects are not going to fair very well. The hearing for the WAA has a scheduled time of 9am, so if you are coming, 9 is the time.There should be a new commissioner appointed by Diane since Fiddaman has stepped down, and hopefully that will help with a continuance to review another DRAFT. On Wednesday, Jan. 9th, the county Planning Commission will hear the staff recommendation to create a new discretionary Water Availability Analysis to be applied to new projects coming through the County planning department. It begins to counter the formulaic approach used in the past that was sufficient for a county not terribly concerned about its future water supply. Things have changed. It is a major step forward, particularly in the watershed areas where neighbors are becoming concerned that their life sustaining water is being sucked up to enable new vineyard and wine-tourism developments. This is what a forest of living trees looks like after clear-cutting and reduced to large piles of sawdust. About 13 ft. high. The Register has been carrying stories on residents opposing developments which destroy natural environments and community values. Long letters to the editor, intelligent and articulate. Are we seeing the emergence of a political movement here? Perhaps comparable to the spirit which produced the policies which have given Napa County a national recognition? With the housing policies assured in the Napa Pipe project, will we be hearing arguments that we can afford to control future vineyard developments. I am hearing vineyardist friends saying, "Maybe enough is enough." They, too, appreciate the vision of forests on our horizons, as do visitors. This is not just about the loss of pretty flowers. It is the destruction of habitat for deer,fox, possum. Habitat for numerous kinds of plants. Destruction of the vital role which trees play in the climate and in retention of water in the soil. In Angwin, we advocate the preservation of agriculture on the green fields in the heart of the community. But residents here put great value on Open Space and AWOS appeals to them for that reason. AWOS is both. Water Report from The Nation! 60 Minutes does groundwater depletion in Calif.
One wonders whether applications for permits that involve water are primarily for the vineyards, or for the appropriation of the water rights. Vines and grapes have a value; but if we're facing a future of limited water supplies, and there is no current regulation of well water, the water itself might be more valuable than the grapes. When water is in exceedingly short supply, what's it worth? Dan Mufson sends this link to a large vineyard conversion project happening up the coast similar to the Walt ranch project. California agricultural deforestation is obviously becoming an issue everywhere. Water Availability Analysis (WAA) 2014-11-05 6 30 pm 8 30 pm Napa County Library, 580 Coombs Street Napa, CA 94559 There will be a Public Workshop on proposed changes to Napa County�s Water Availability Analysis (WAA) at the Napa County Library on Wednesday, November 5th at 6:30pm. This is the forum we want to attend, lending our voice and experience to the Dept of Public Works as they decide how to structure the WAA in the future. Click on the WAA for info. The Mt Veeder Group has encountered a difficult problem with the Woolls Ranch Winery application and WAA. Of 3 wells, their main well has vine damaging Boron @ 4x too much, and Arsenic @ 5x too much, but the WAA glosses over this fact and counts the water as available. So we are working on an educational example of this situation. After hearing that Christian Moueix was a practioner of dry farming on his Dominus Estate, there is now a TV report on John William's use of dry farming at Frog's Leap. How many other Napa farmers use this extremely water efficient method? In addition to saving millions of gallons of water each year, there are electricity costs saved in not pumping water. Shouldn't the county be giving additional encouragement to the process? County Executive Officer requests one (1) appointment representing the Public At Large from the applicants listed below and re-appointment of Gretchen Stranzl-McCann, nominated by the Napa County Resource Conservation District Board of Directors to represent the District on the Watershed Information Center and Conservancy on August 14, 2014, with the terms of office to commence immediately and expire August 2018. Lake Berryessa Sept 2014 - the water level is 36 feet below the normal surface. I�ve been hearing through the grapevine (no pun intended) that we may have wells down on the valley floor that are being drilled to depths of 800 to 1,000 feet these days. If that is in fact the case and we have people and companies pulling up water from those great depths, the obvious concern is that the wine industry may be facing an existential threat if we don�t start thinking about ground water availability in a more sustainable way in the County of Napa. From what I�ve been reading lately, much of the agricultural community in the western United States is facing the same issue of prolific ground water depletion. Now I read this weekend that the Senate and the Assembly up in Sacramento have just sent two bills to the governor�s desk to try to help address the issue of groundwater depletion on a statewide basis. From what I can glean, local government will get the first crack at creating a plan for long-term groundwater management. If I have all this right, it would mean you and staff have a historic opportunity to approach groundwater depletion for the first time in a sensible, comprehensive and sustainable manner. On behalf of the citizens of Napa County, I respectfully request the creation and implementation of a comprehensive ground water management plan to promote the availability and quality of ground water for current and future generations of Napa County residents and businesses of all types. In the meantime, as much as it pains me to write this, I think it�s time to seriously consider adopting a temporary moratorium on new wineries, vineyards and other intensive water uses until you all and county staff have had a chance to dig into this matter and begin to figure out what needs to happen to avoid a water availability catastrophe. Such an eventuality may be only one dry winter away. I will close with an article from the Wall Street Journal describing the rather bleak situation folks are facing down in northern SLO county. A word of caution, this is scary stuff. Thank you for your time today in reading this and again thank you for your service. 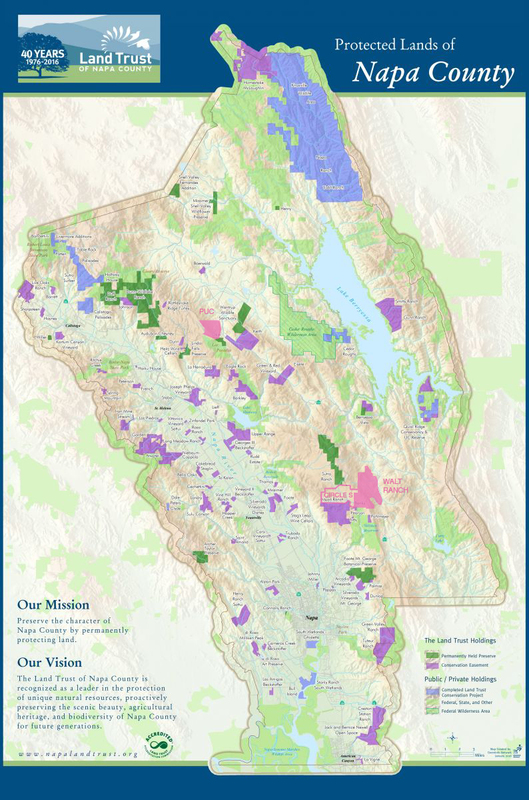 The following article from 2009 describes the 1000 acres of vineyards being proposed for the Atlas Peak watersheds and the eastern hills of the valley. The Stagecoach acres have probably already been added, Circle S has been approved in 2011 with at least 2 blocks in production, Upper Range Project, in the hills above Mumm, approved but no blocks developed ?, Walt Ranch is in EIR Public Comment period. Circle S Ranch, Walt Ranch and Stagecoach are all on the slopes of Atlas Peak in our neighborhood. Be sure to watch the video - most informative. This article on the conflict between local and state control of ground water in Napa and Sonoma Counties might be of interest. I am sorry to have missed your meeting yesterday morning, for I did want to attend, but our main issue, Woolls Ranch Winery Appeal, was coming before the BOS this morning and I was concentrating on this issue and reading the Draft of a Phase II Water Availability Analysis that was requested by the county, commissioned by Woolls and performed by Luhdorff & Scalmanini. The WAA turned into a document of major importance since the report calculates the available water on the parcel (236.6 acres) at 15.4 AF/y, which is less than the proposed use for the vineyard and winery, and way less that the available water calculated in the WAA Phase I using 0.5 AF/yr/Acre of land. The county has to digest this new information and prepare a new CEQA neg dec based on this new information, and the hearing has been postponed to October 21, 2014. It might get kicked back to the plan comm and start all over again from the beginning. We await the final draft and a more detailed explanation of the interference between a vineyard well and a direct neighbors well. I did want to bring some other information to your attention concerning setbacks and variances. Two other winery applications have major variance requests: Castellucci and LMR Rutherford Estate Winery. Castellucci was granted the Variance but LMR REW (long meadow ranch - across 29 from Grgich) was postponed for 30 days to study a change in the setback & variance to within 120 ft of 29. The parcel has enough room for a 600' setback, but Ted Hall of LMR wants to do the responsible thing and not place the winery next to the slough at the back of the property. He does not want to add fill and raise the winery above the flood plain as Silver Oak did for their remodel after the fire. He is adamant that he should save the slough and the flood plane by putting the winery closer to 29. LMR also had a Farm Produce retail operation at the site, but this has been moved to Farmstead in SH to avoid conflict with the winery visitation which is by appointment only, where the Farm Stand visitation had no restrictions. The county wanted complete separation and LMR solved it by moving the operation north. I wonder if YHW and LMR will be on the same agenda at the PC. All, Do you think this should this be sent out to our email group? Located at 3207 Soda Canyon Road. HAYSTACK PEAK VINEYARDS - ENVIRONMENTAL REVIEW on maintenance of approximately 6.6 acres of existing vineyard, and land disturbing activities on slopes greater than 5% associated with Erosion Control Plan #P10-00102-ECPA for the development of 24.2 acres of new vineyard (19.7 net acres). The project site is located in the Rector Reservoir Drainage on the west side of Soda Canyon Road approximately 3.0 miles north of its intersection with Chimney Rock Road, within an AW (Agricultural Watershed) zoning district (Assessor's Parcel #: 032-440-016). CEQA STATUS: Negative Declaration Prepared. According to the Negative Declaration, the proposed project would not have potentially significant environmental impacts in the following areas. This project site is not on any of the lists of hazardous waste sites enumerated under Government code section 65962.5. The proposed Negative Declaration is available for inspection, along with copies of all documents which relate to the above described project, between the hours of 8:00 a.m. and 4:45 p.m. Monday through Friday, at the office of the Napa County Planning, Building, and Environmental Services Department 1195 Third Street, 2nd Floor, Napa, California. Written comments regarding the environmental effects of this project, the adequacy of the measures identified, and the adequacy of the proposed Negative Declaration are solicited. All such comments must be presented during the public review period, which runs from May 2, 2014 through May 22, 2014. Comments should be directed to Kelli Cahill, Napa County Planning, Building and Environmental Services Department, 1195 Third Street, 2nd Floor, Napa, California and must be received before 4:45 p.m. on Wednesday, May 22, 2014. The Director of Planning, Building and Environmental Services Department will not act on the project during the public review period. Thereafter, he will consider all written comments received regarding whether or not the proposed project would have a significant effect on the environment, any written responses prepared, and the adequacy of the final environmental document produced prior to taking action on the project. An appeal to the decisions of the Director of Planning, Building and Environmental Services regarding this project and the related environmental document must be filed in writing with the Clerk of the Board of Supervisors in the manner required by Chapter 2.88 of the Code. If you challenge these particular proceedings in court, you may be limited to raising only those issues you or someone else raised during the comment period described in this notice.